Japan is the richest land when it’s about magical places, in every sense! 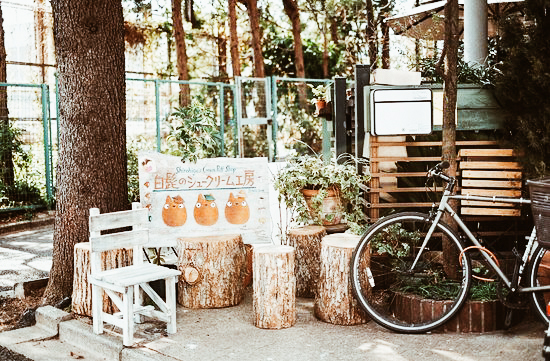 Even stopping for a snack can become a unique experience when you immerse yourself in a fantasy world like that of the "Character Cafes" scattered throughout the territory. What are these places? 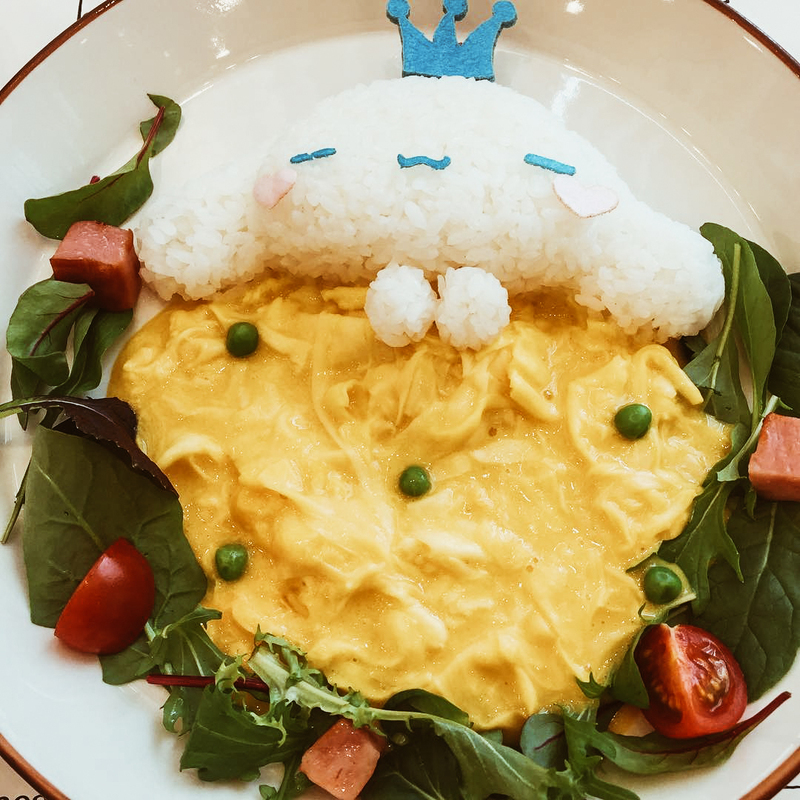 Particular types of themed cafes that allow customers fond of comics and animation to savor incredible kawaii dishes in a room totally inspired by a specific character. 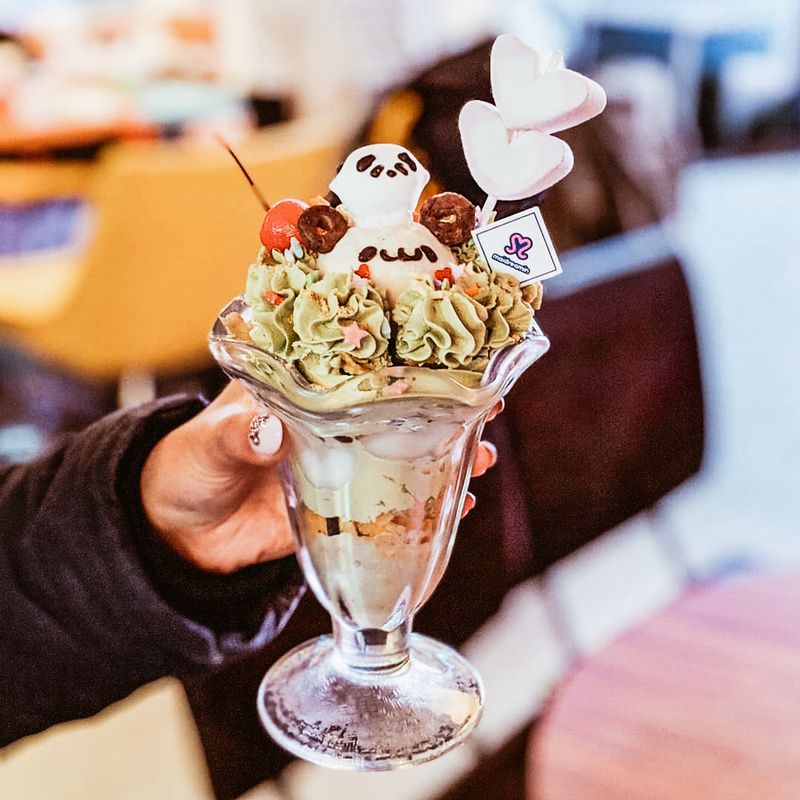 There are temporary concept cafes that open about every two months, but fortunately, there are also permanent ones and they are a fundamental step for anyone who wants a bit of sweetness. 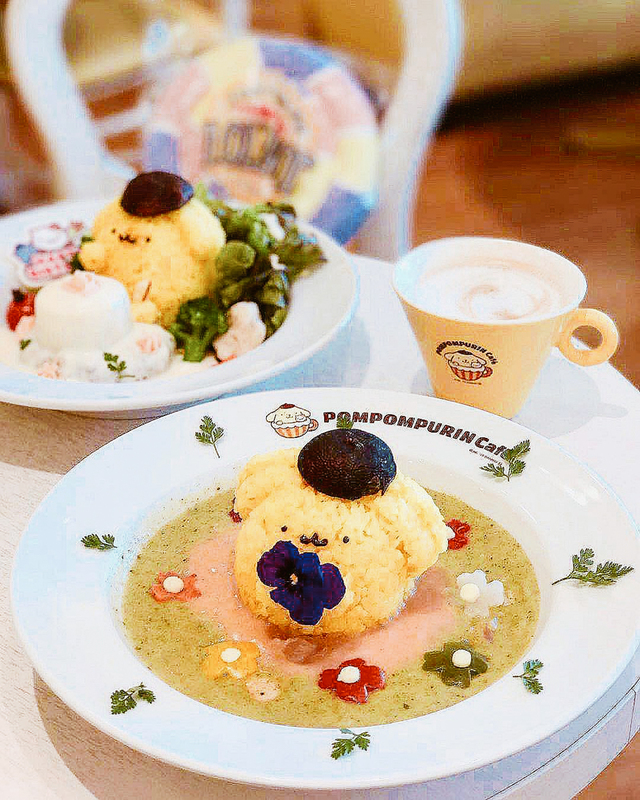 Entering the PomPomPurin Café is like entering the room of this sweet big dog, a famous Sanrio character. 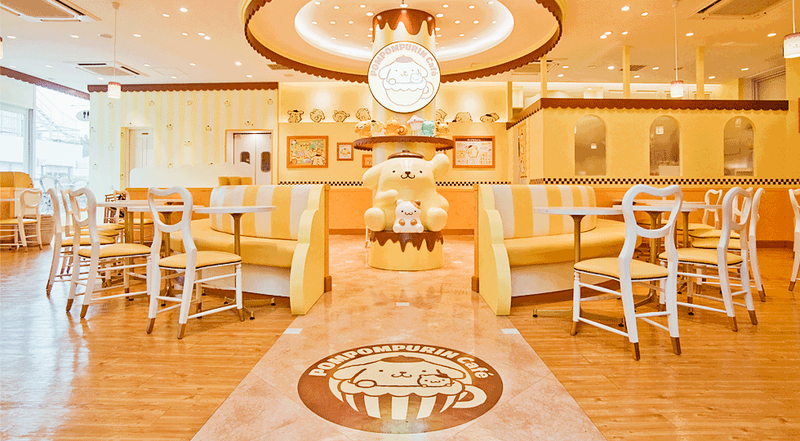 You are welcomed by the yellow and brown of the furnishings, a quiet and relaxing place where you can enjoy sweets, drinks and specialties of various kinds. 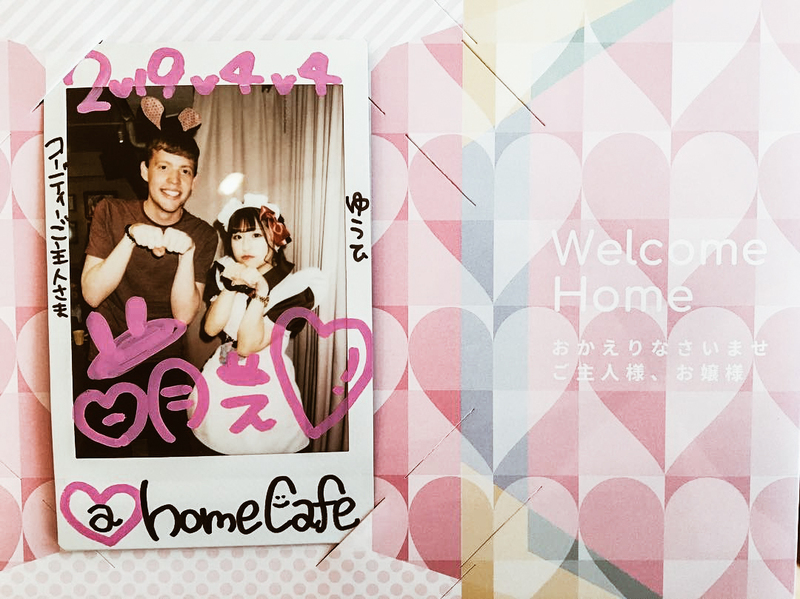 Inside the café there are "photo corners", dedicated points to take a picture with your favorite pudding! 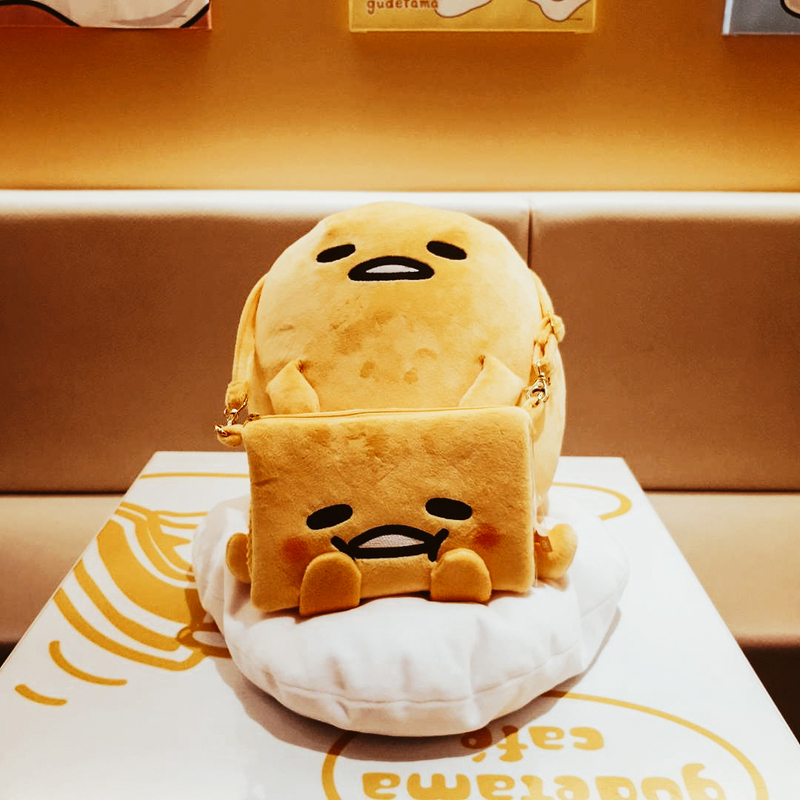 There are also limited edition goods that can only be purchased at the in-house shop. 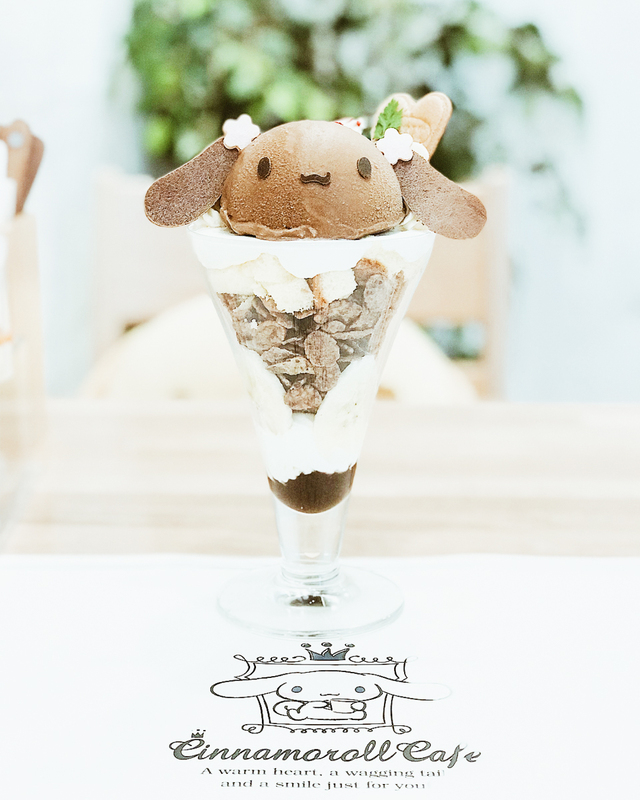 Final Fantasy Eorzea Café is a small sanctuary for all fans of the famous Square Enix game FFXIV. Eorzea takes its name from the region where the video game takes place. 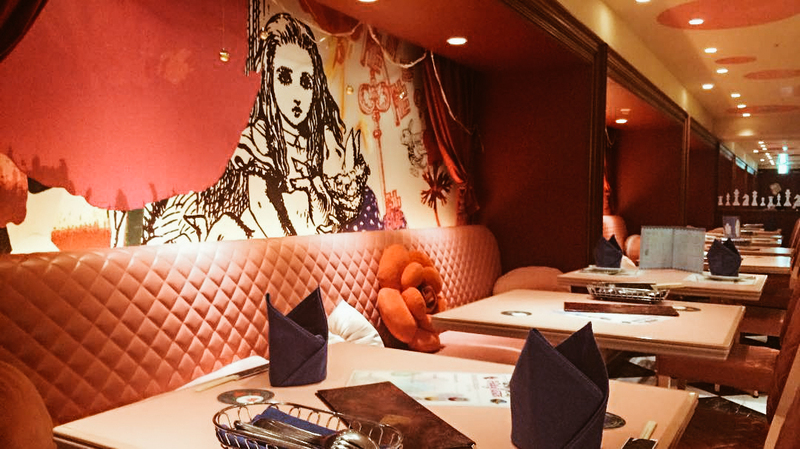 Its interiors are beautifully decorated and the café in Akihabara also has a bar where you can order alcoholic beverages. The food and drinks served at the bar are constantly changing, just like in the game! 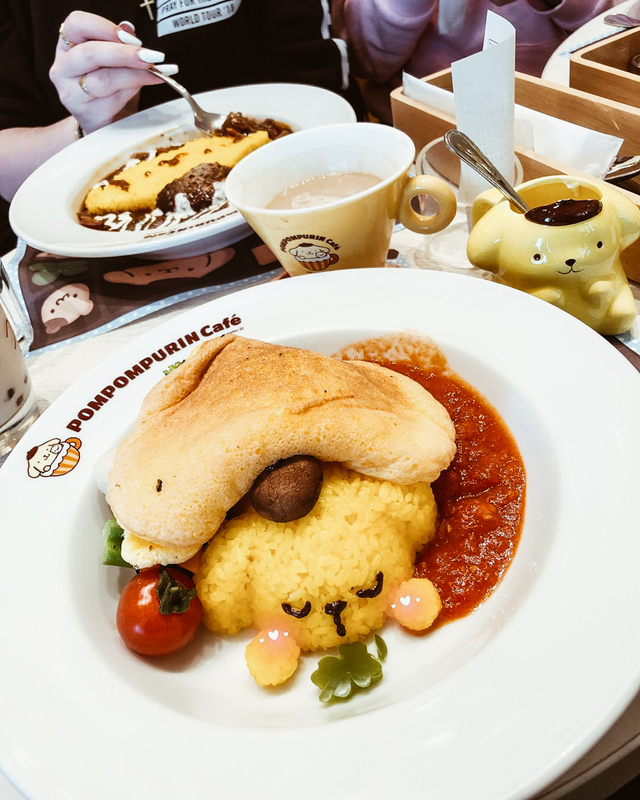 By ordering different drinks you can receive a collector's coaster and the restaurant has a point collection system with which special goods can be won, in addition to those that can be purchased at the dedicated sales corner. 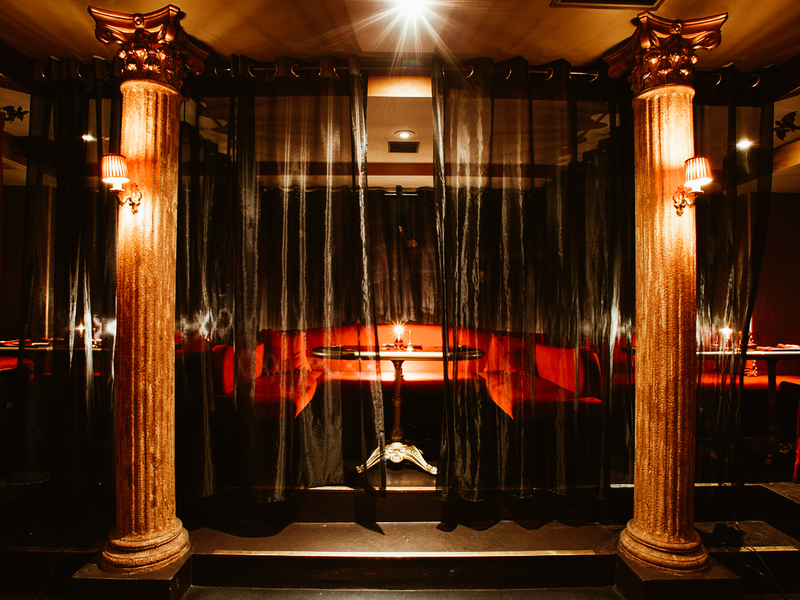 Reservations must be made at least two hours in advance if you wish to find a place in this space. 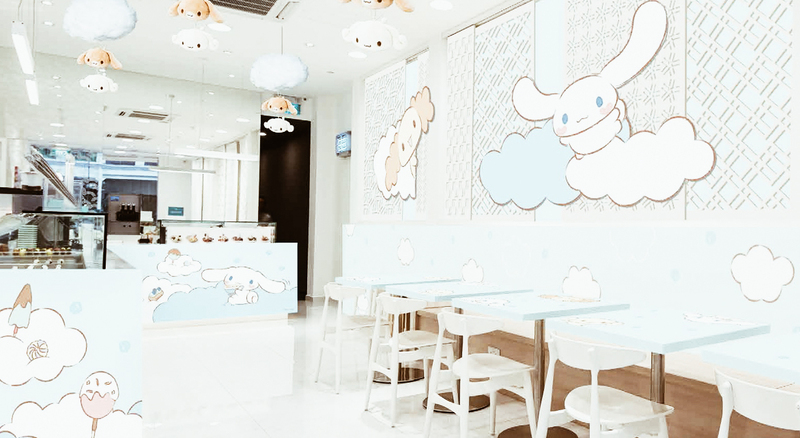 Cinnamoroll, a white puppy with long ears, blue eyes, and a curly tail, is one of the most adorable characters of the Sanrio brand. 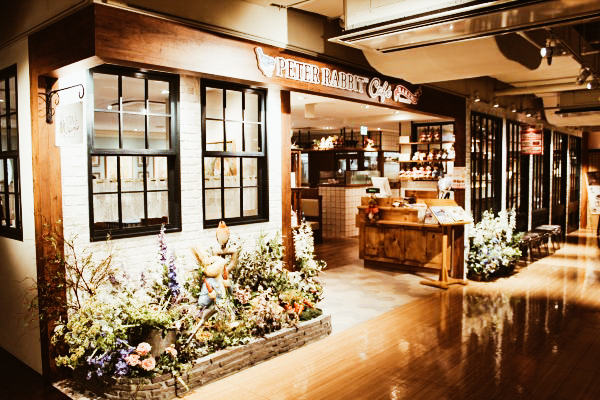 The environment of this café creates an extremely relaxing atmosphere thanks to its delicate colors and its irresistible dishes. 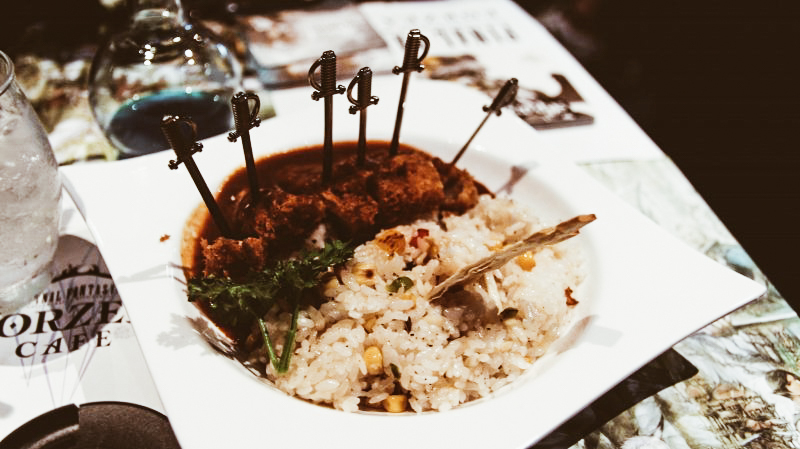 Here it is possible to taste the Omu rice, the Stroganoff fillet, the special Shortcake and some seasonal dishes. 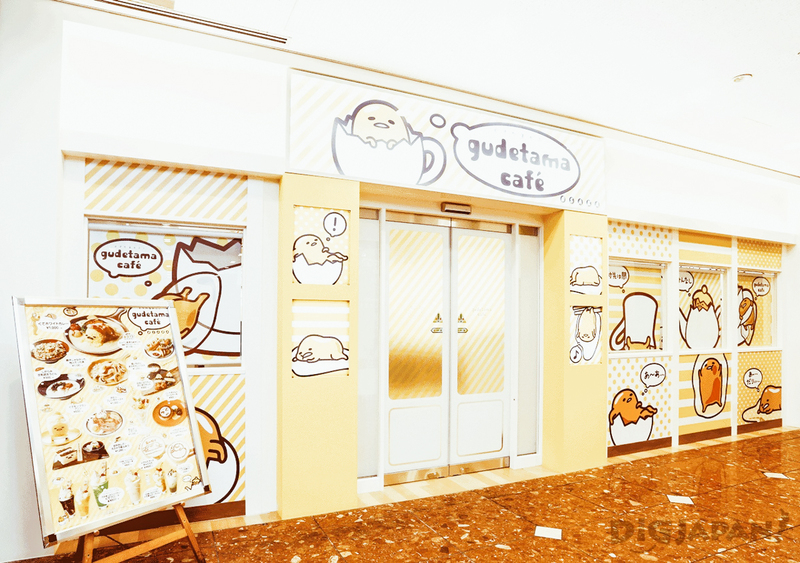 There is also a shop with limited edition goods. 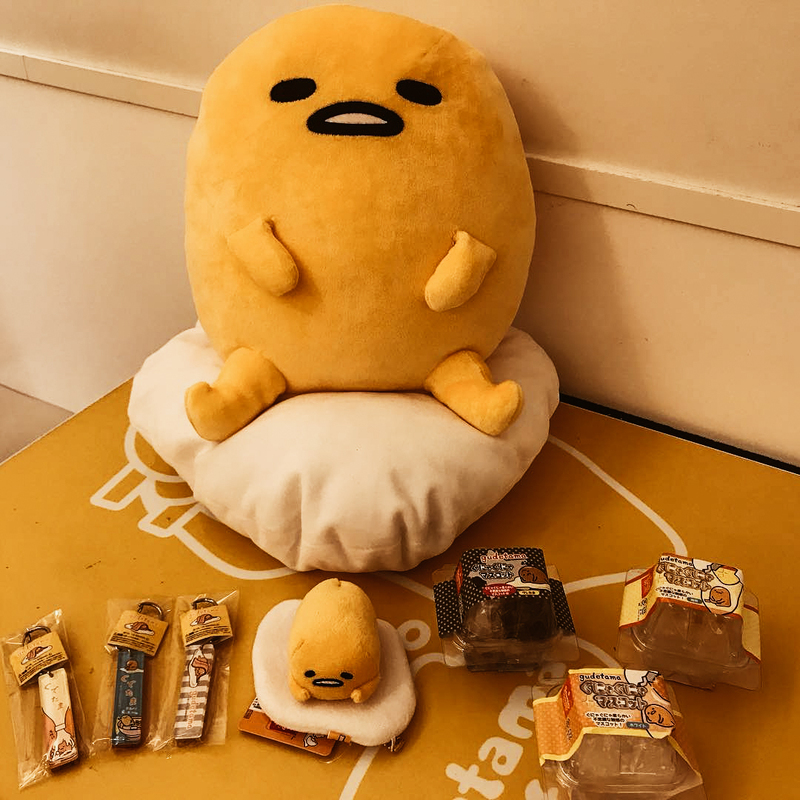 Gudetama is a lazy egg who thinks that everything is mendokusai (a pain) and never has any motivation. 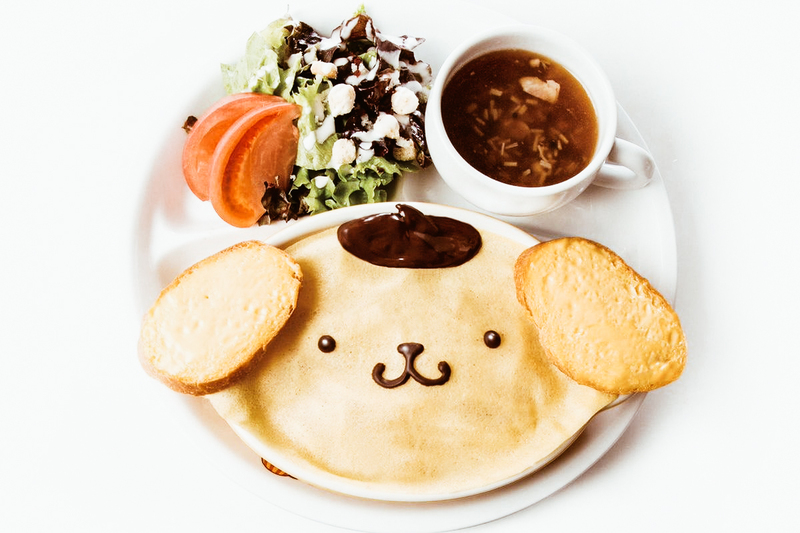 And he is the protagonist of the cafe located on the seventh floor of HEP FIVE, a shopping center near the Umeda station in Osaka. 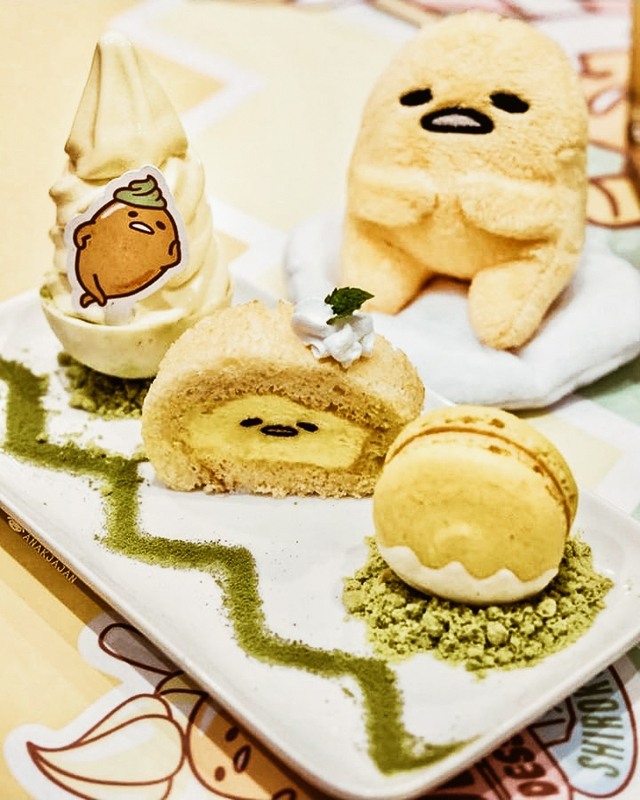 Recognizable thanks to its designs, this café offers an exquisitely evolving menu that reflects the lazy and unmotivated nature of its character, in an environment that combines all the shades of pastel yellow with large plush toys by Gudetama in its classic lazy poses. Cups, magnets and gadgets of various kinds are available to be purchased to bring with you the memory of the most lethargic experience ever! 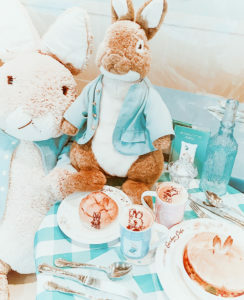 Through the winding streets of Jiyugaoka in Tokyo, a small garden café is hidden, inspired by the stories told in the world of Beatrix Potter whose protagonist is Peter Rabbit. The atmosphere inside the cafeteria is very welcoming and inviting. 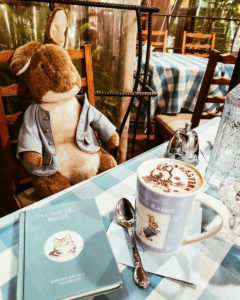 The blue and white checkered tablecloths cover every table that is decorated with the author's books that you can read and draw on and, sitting next to the customers, you can find the stuffed animals. The wooden floors and furniture give warmth to the environment while various photographs are hung on the walls. On the shelves we find flowers, woven baskets, gardening tools and small objects that evoke images of the picturesque English countryside. 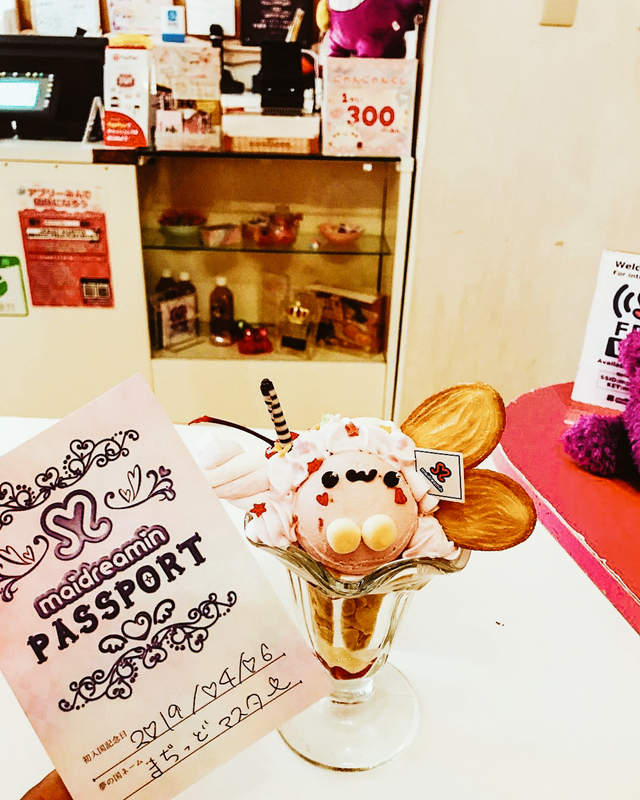 Every dish on the menu is carefully designed and, of course, there is a small section dedicated to souvenirs if you want a small piece of sweetness to keep as a souvenir. 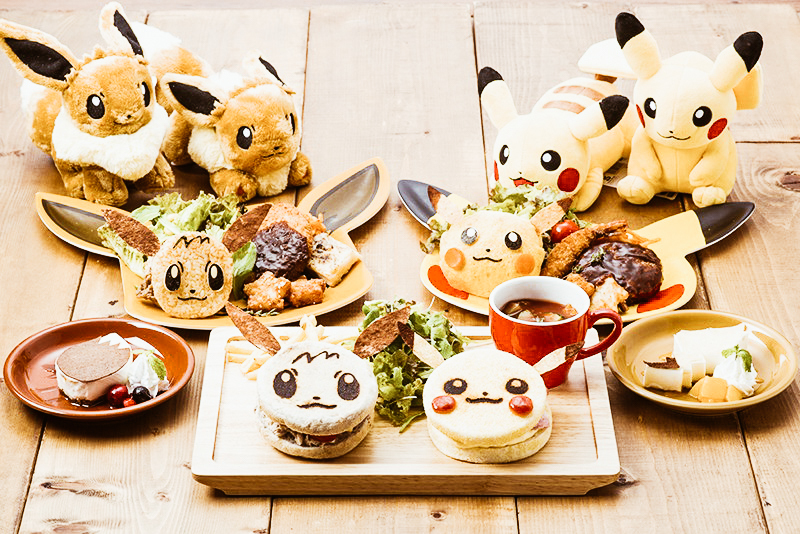 Have you ever dreamed of shouting "Gotta catch'em all!"? 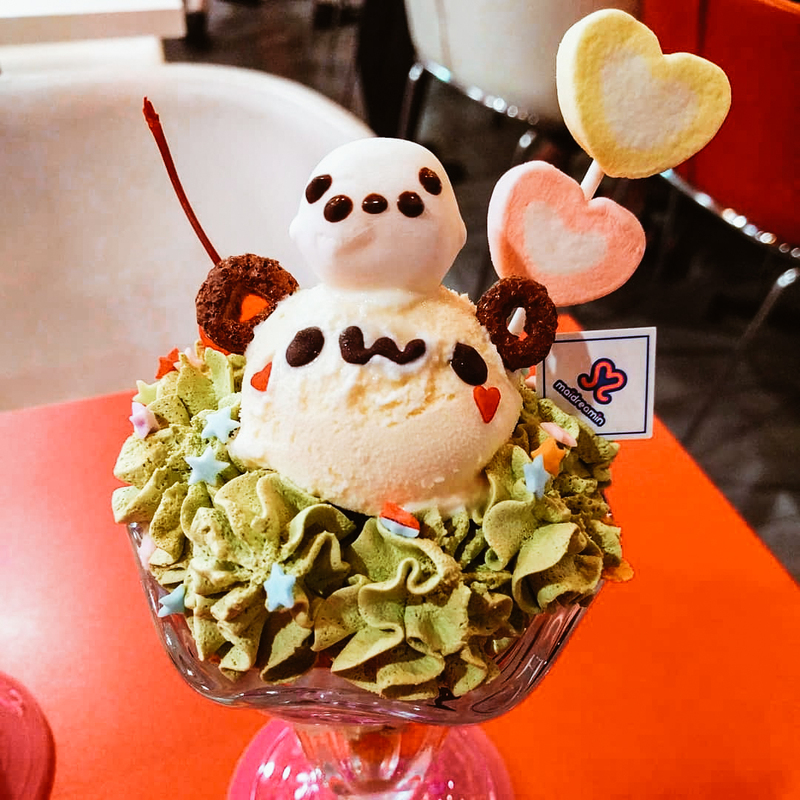 You may not be able to do it literally, but the most loyal fans will find joy at Pokémon Café. 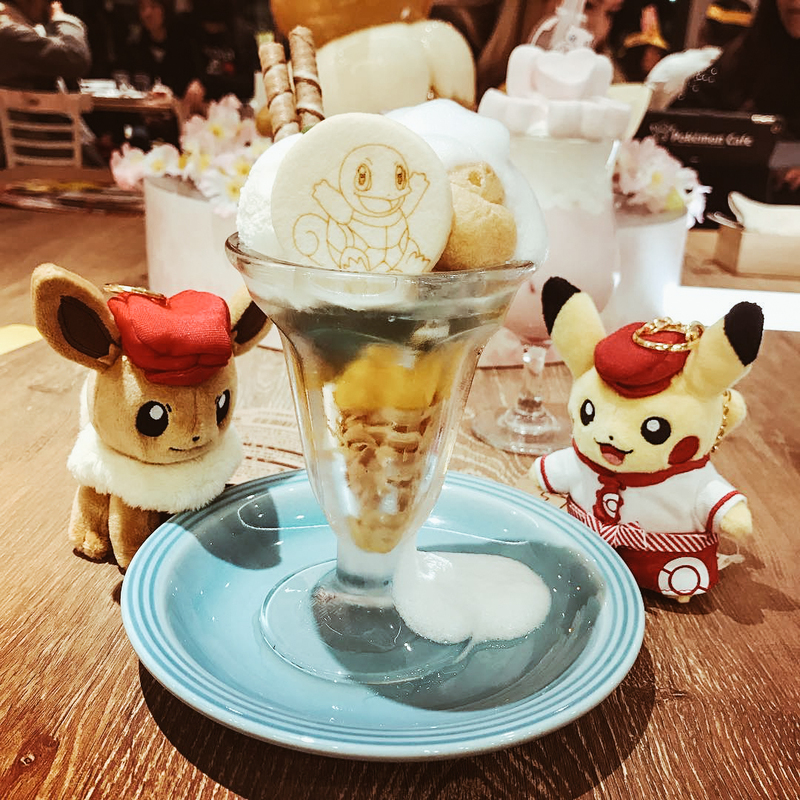 Opened in 2018 and associated with the Pokémon Center DX, this restaurant is spacious and bright, furnished with simplicity and minimalist decorations, with wooden floors and large tables. 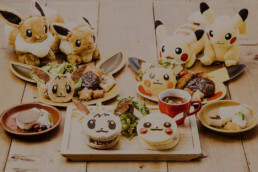 As in any self-respecting character café, Pokémon-themed food and drinks are available, in addition to the seasonal menu available only for a limited period of the year. The unique gadgets always attract collectors. 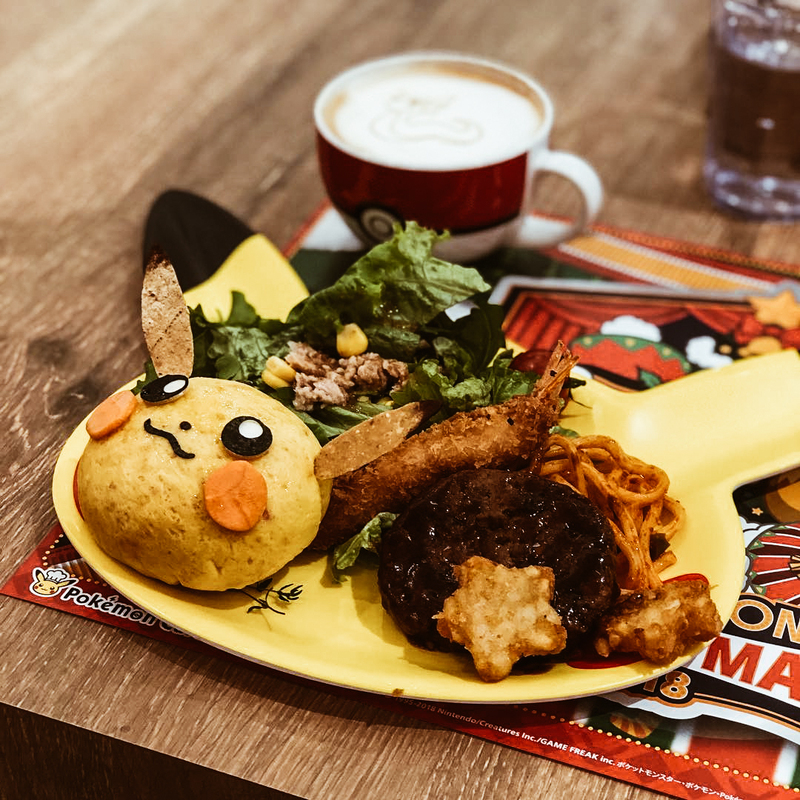 In fact only here is it possible to find poke-thermos, Pikachu stuffed animals in a cook version and the famous Pokéball-shaped cups! Unlike other cafes, online booking is required in advance as the seats are highly sought after. 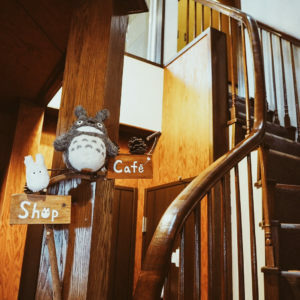 A solitary sign with 3 small painted Totoro signals the existence of this small café in the quiet neighborhood of Daita, hidden among many plants and tree trunks. 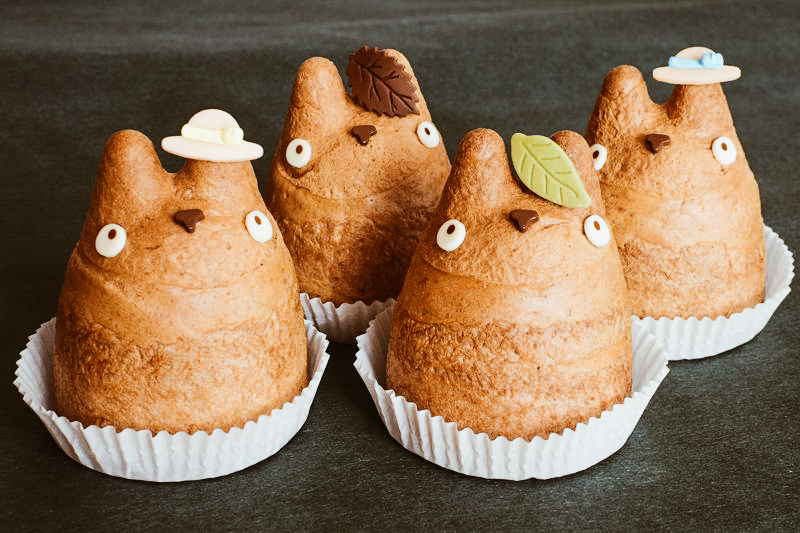 Adorable puffs inspired by the famous Studio Ghibli creature are served in various flavors. From traditional vanilla and chocolate to seasonal matcha, white peach and Adzuki beans. 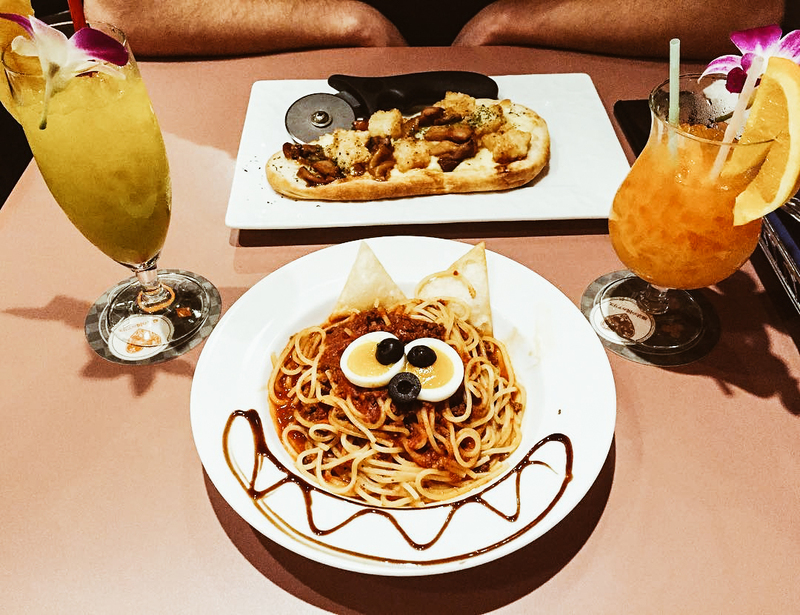 But if your stomach demands something more, just go up to the second floor, to the Toto Café where tasty pasta dishes are served with iced coffees. 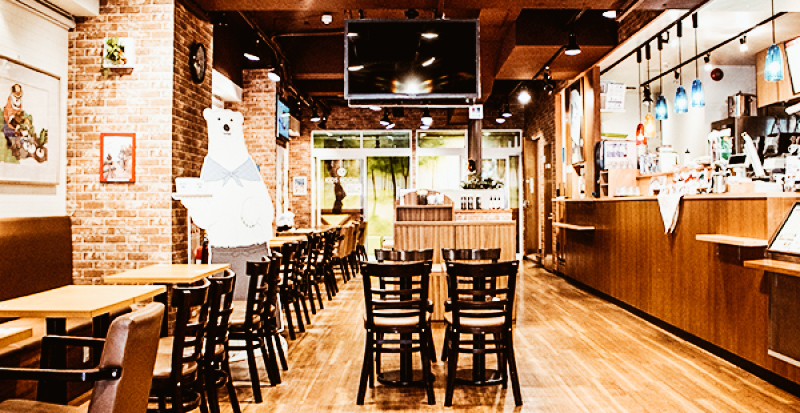 Shirokuma-san, the big polar bear who stars in the manga written by Aloha Higa and owner of a bar that welcomes animal and human friends, is also the inspiration for this cozy café. 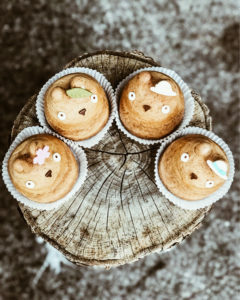 Lots of masterfully modeled bear-and-panda shaped dishes will inspire customers to take lots of photos, captivated by their beauty and tenderness. 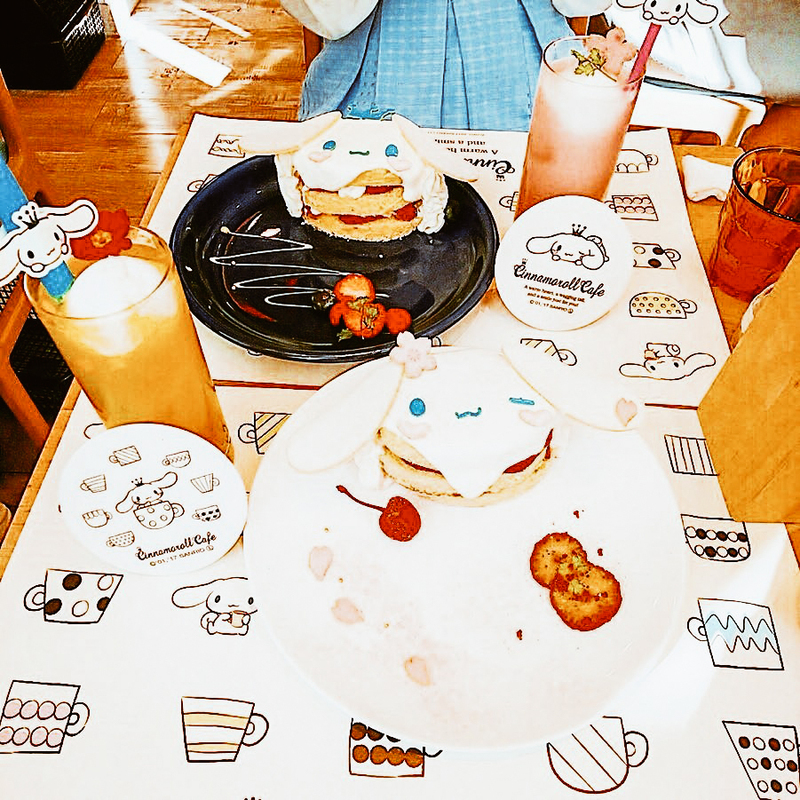 The restaurant is cozy and guests can pose for many souvenir photos with adorable cartoon characters, while children can have fun in the corner dedicated to them, full of toys and a television! 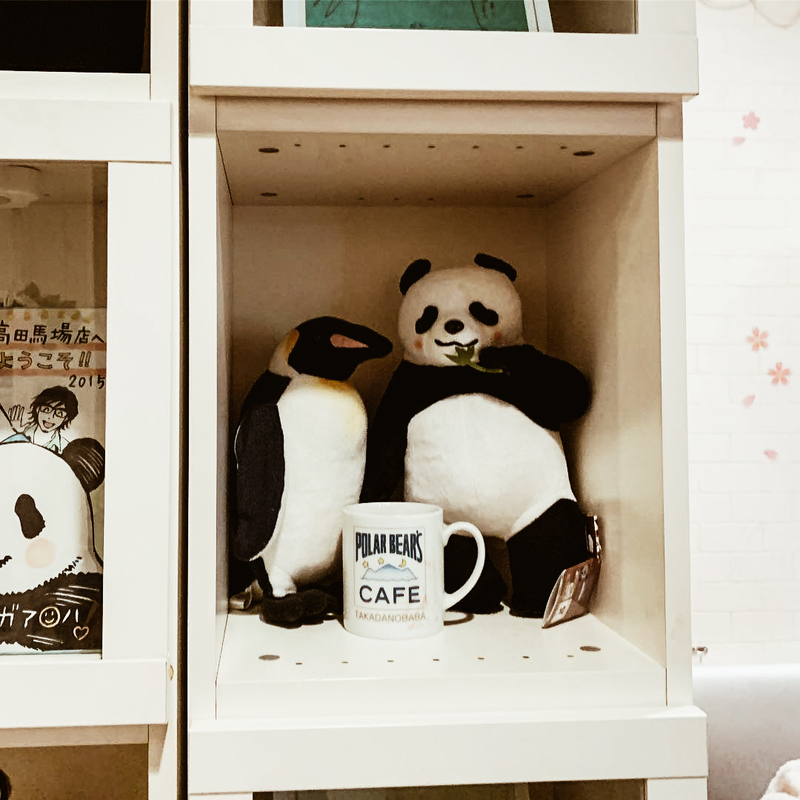 Do not miss the small shop where you can find soft stuffed animals, notebooks, t-shirts, bags, stationery and bento boxes. 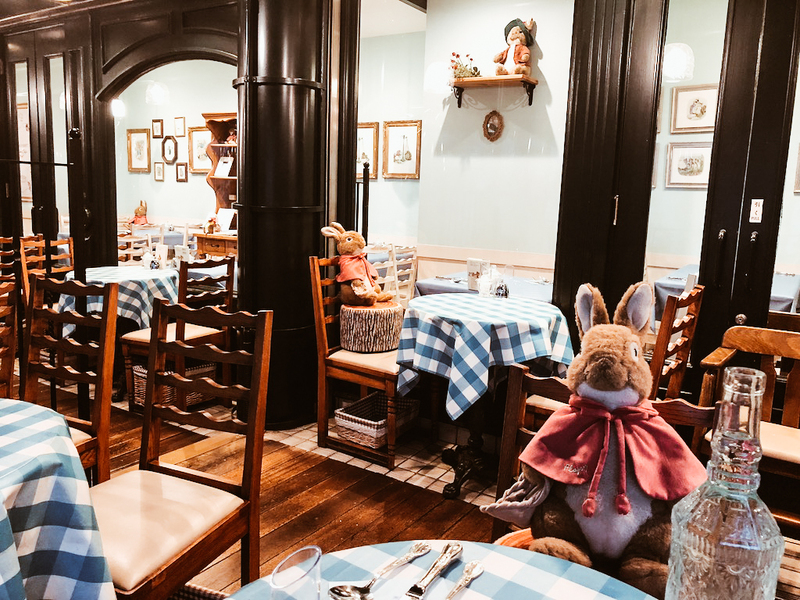 Five restaurants inspired by the Lewis Carroll novel have permanent locations in Japan. 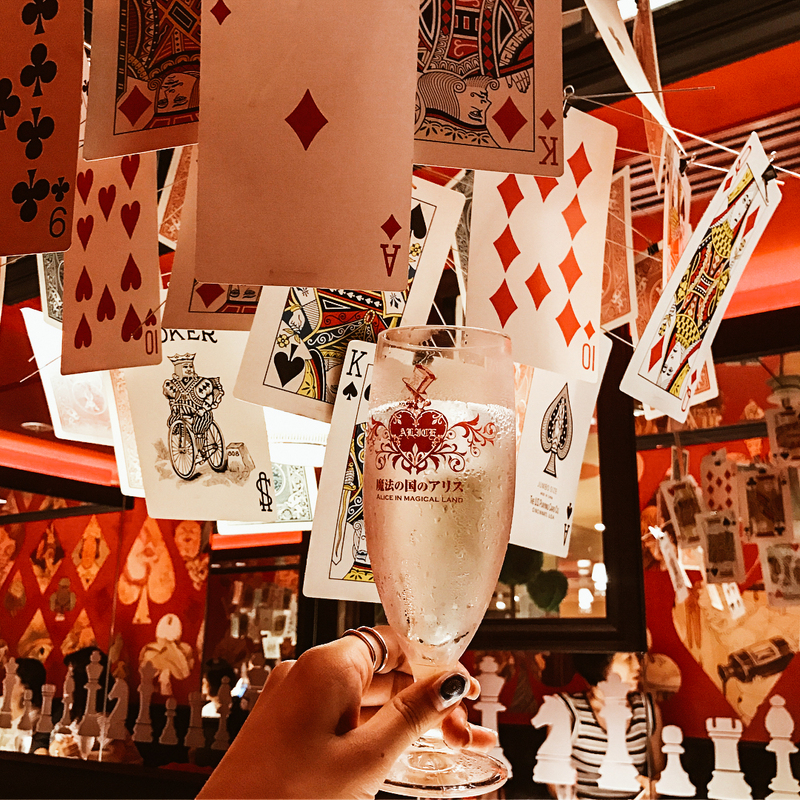 Each of them is extraordinarily engaging and transports visitors to the different scenarios of Alice's world. There are five themes to choose from: the maze, fantasyland, the fantastic book, the magical land, and the old castle. 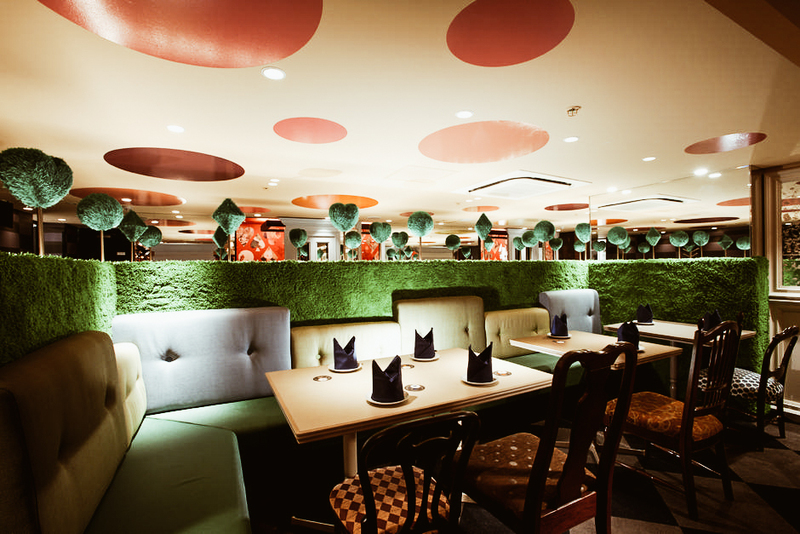 The menu is strictly inspired by British cuisine. 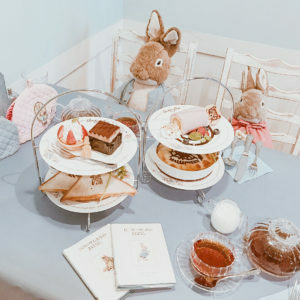 To enter the wonderland it is necessary to book online or you can do it in person by going to the restaurant a few days before. 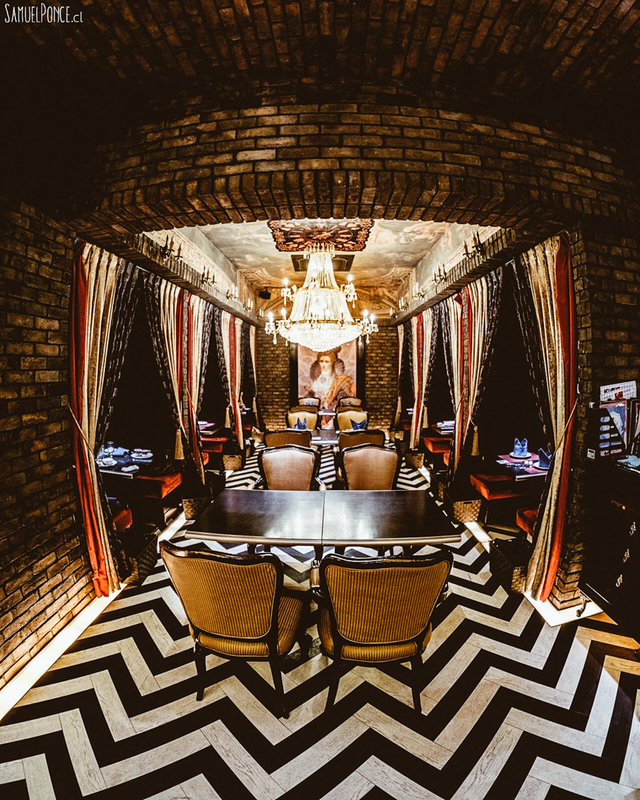 A macabre atmosphere, red velvet curtains, and luxurious chandeliers catapult customers into Medieval Europe, into a real "vampire house". 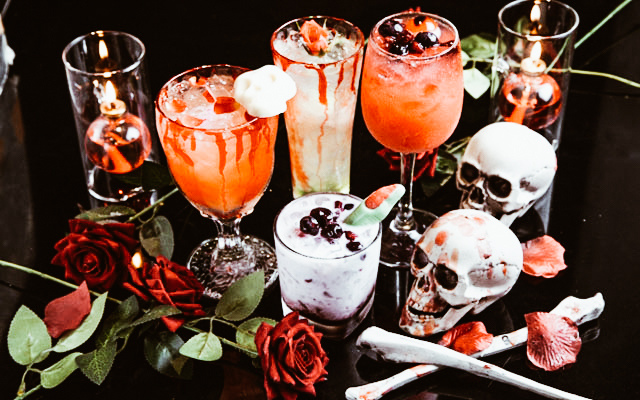 Inside the café, there is even an altar, a coffin and a cross struck by a beam of light to allow total immersion in the gothic world of the legends concerning the creatures of the night. 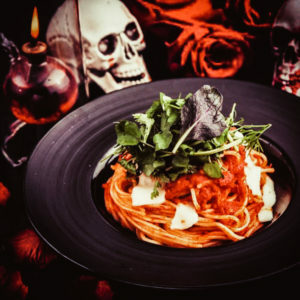 Of course, the menu is also thematic: dishes and cocktails with unique names belonging to the Italian and French cuisine and are served by staff in a vampire costume. 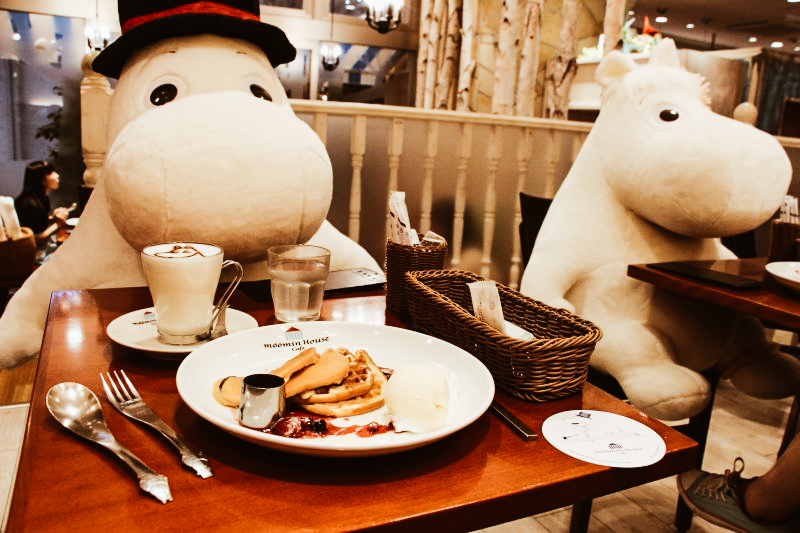 The Moomin, despite belonging to the Finnish tradition, have also found a way in Tokyo to welcome fans into their world. 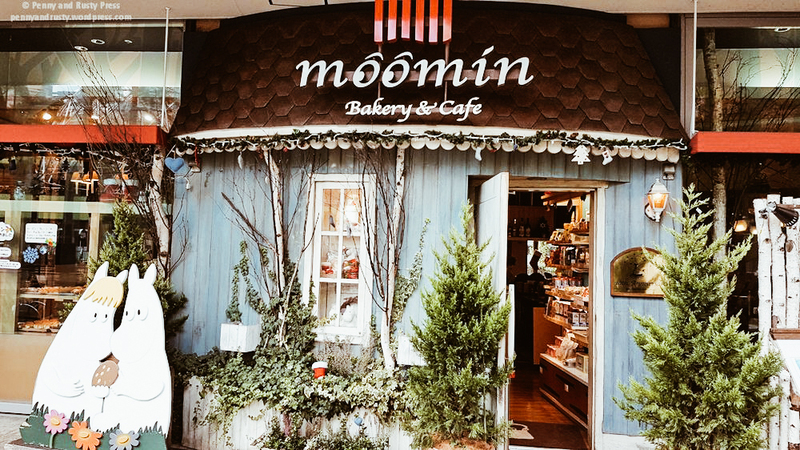 The environment recreates the natural woods in which the Moomins live, giving the café that relaxing and timeless aspect whose goal is to allow everyone to have a place to get together and where they can witness many fun moments. 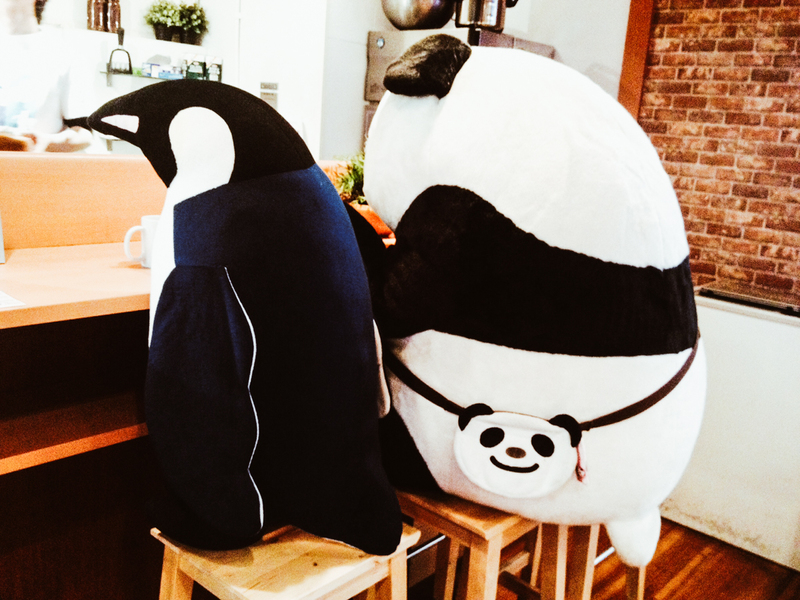 Big puppets live in the café and keep company to the lucky visitors who are able to sit next to them. 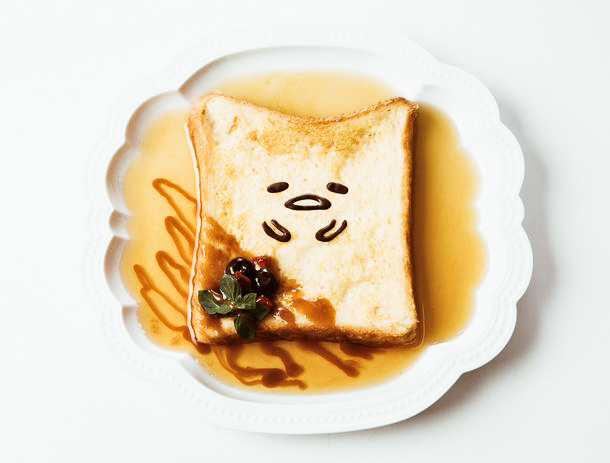 The dishes are tasty and as always perfectly presented to pamper the heart of those seeking a moment of tenderness. 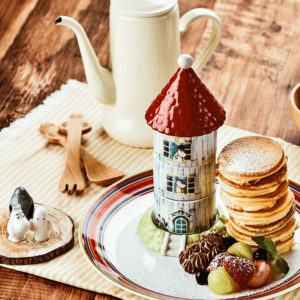 The most famous menu is the "Souvenir Moomin House Pancakes" because the pancakes are served at the table along with ceramic figurines as a souvenir to take away with them. 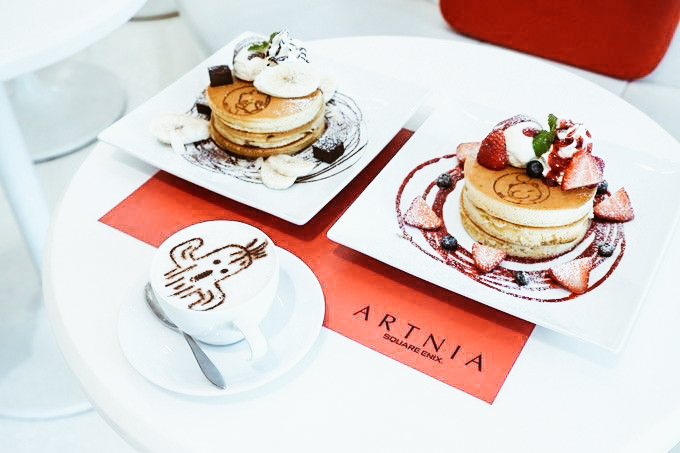 Located in Shinjuku, Artnia mixes its being Square Enix's official goods store with the café whose dishes are based on the company's prestigious game series. 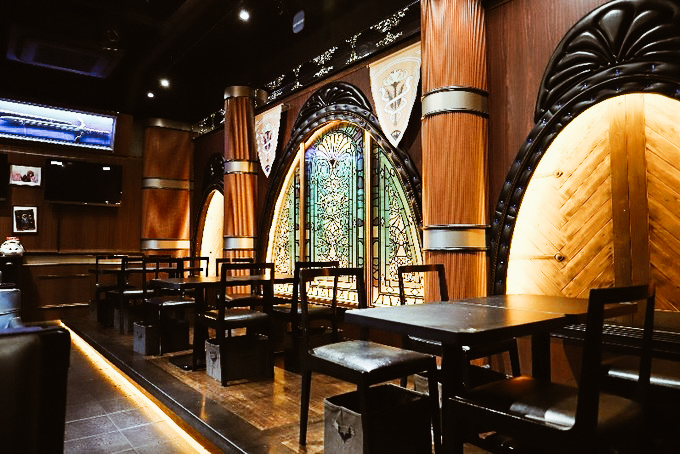 Inside, it’s divided into 3 areas: the "Fancy Area", the area dedicated to the merchandising of Dragon Quest, Final Fantasy and Kingdom Hearts, the real "Café & Bar" that occupies most of the space and the splendid "Luxury Area” located behind the bar and designed in black granite. 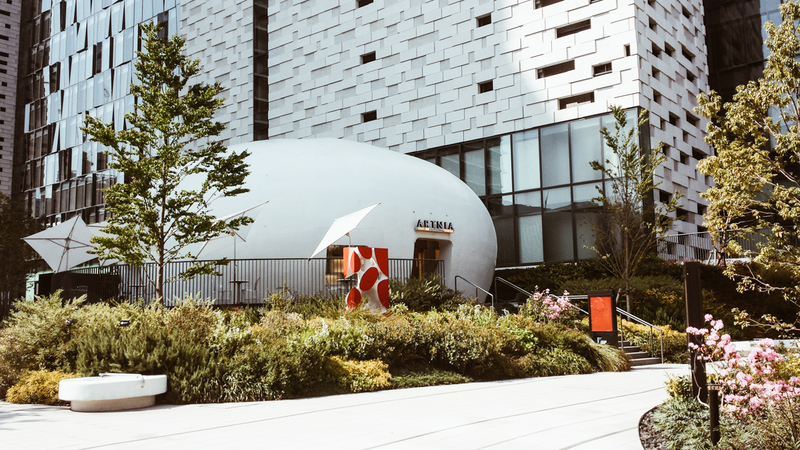 This luxurious area is a real museum containing replicas of the sagas, statues, works of art and jewels, but it is the fountain that rises in the center to be the real attraction of Artnia. It contains a red crystal suspended inside a waterfall that pours into a pedestal with all the spheres of Materia of various colors. 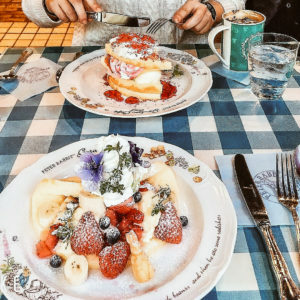 Better known as "Meido Kissa", the maid cafes are places where customers are served by Victorian-style waitresses, with their clothes full of lace. These maids have the specific task of satisfying customer requests, so the customers are called "Masters" if they are men, or "Princess" if they are women. These places are mostly concentrated in Akihabara and are always full of extremely accurate details. Once inside, a Maid will accompany the visitor who can only stay for 1 hour to the table and will have to choose whether to drink, eat or another of the available proposals. 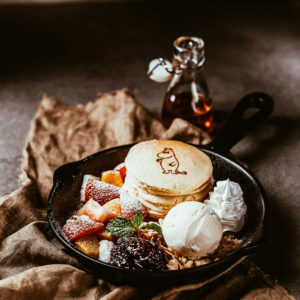 Moreover, the waitresses interact continuously with the customers and if these are not very talkative, then they will start to do ballets and sing little songs. 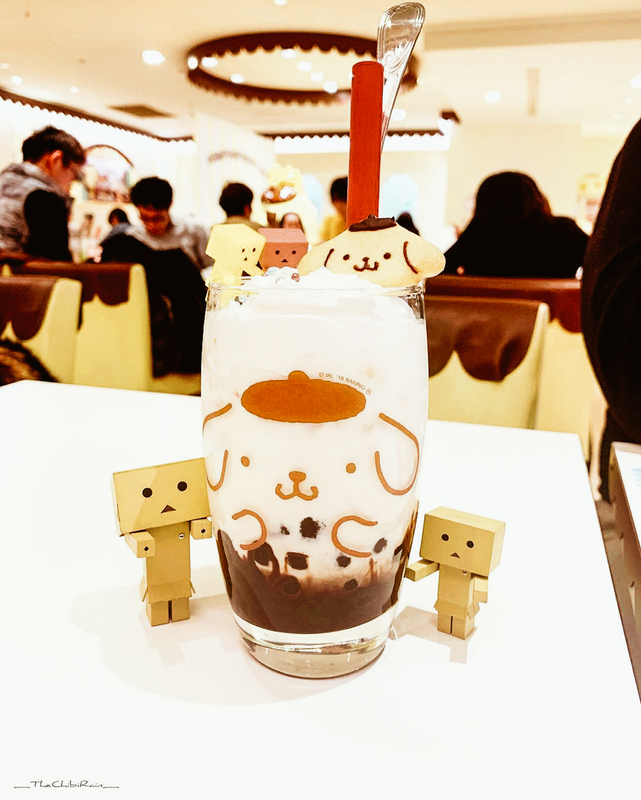 They are very fun and carefree environments, for a more original break than usual! 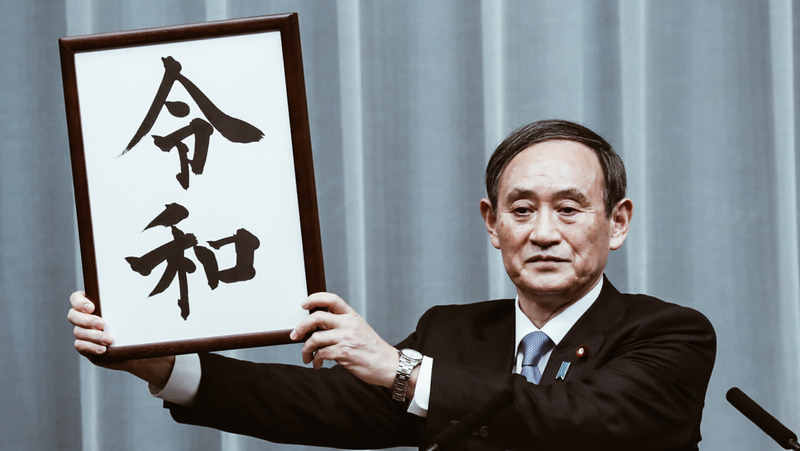 Exactly one month ahead of Prince Naruhito's accession to the throne, Chief Cabinet Secretary Yoshihide Suga announced the beginning of the new Era for Japan. 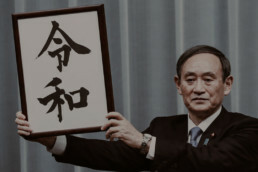 Reiwa, formed by the kanji 令 (rei) "auspicious", "ordered" and 和 wa "harmony", "peace", reflects the spiritual unity of the Japanese people, because "culture is born and nourished when people take care of each other lovingly" explained Prime Minister Shinzo Abe immediately after the announcement. In the Japanese culture, the periods of time throughout history are subdivided according to the system of "eras", gengō (元号): it involves the use of two kanji that represent the hopes, ideals and good intentions for the period to come, followed by the number from the year of the emperor's mandate. 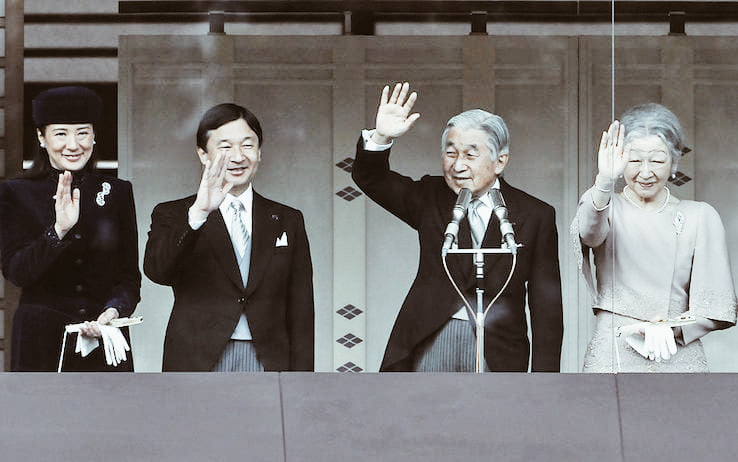 According to this system, from 1989 the current era is Heisei 31 (平成31), or the 31st year of the Heisei Era (31 years of "achieving peace" under the guidance of Emperor Akihito). From May 1st, 2019 we will be officially in the Reiwa Era (令和1 - Reiwa 1). Unlike all previous eras whose names were inspired by Chinese literature, Reiwa has its roots in Man'yōshū, 万集 "The Collection of Ten Thousand Leaves", the oldest collection of Japanese poetry that has survived till today. The authors belong to all walks of life: members of the imperial family, peasants, soldiers, artisans and monks. This choice breaks an over 1300 years old tradition and has a highly symbolic value for Modern Japan. We are wishing for an era of hope and unity and, above all, an era aimed at the preservation of nature. Reiwa will face a path aimed at harmony and to give strength to a nation that in the course of history has always raised up with pride in every adversity and that has never been pulled back. But how was this name decided? The choice was made between a list of 30 proposals prepared by Japanese and Chinese literature and history experts appointed by the government for this important task. The traditional procedure requires the Government to make the final choice in a cabinet session, after which the chosen name is revealed to the Emperor in office and he prepares the decree for the proclamation of the new Era. First born of the current Emperor of Japan Akihito and Empress Michiko, Naruhito (皇太子徳仁親王) became the crown prince to the throne following the death of his grandfather, Emperor Hirohito in 1989. Known for his countless charitable works and a series of absolved imperial functions, he will become the 126th Emperor of the Throne of Chrysanthemum (the oldest ever interrupted monarchy in the world) on May 1st, 2019 following the abdication of his father on April 30th, 2019. The word Reiwa is so full of serenity, even in its pronunciation! The harmony, the peace, the balance that characterize a the people of a nation like that of the Rising Sun thus finds its fulfillment. Just a few days ago, I had a fixed idea in my mind: "a new beginning", I even wrote a thought entitled "Start of a new chapter", and having woken up with the announcement of this new Era, shook me positively. 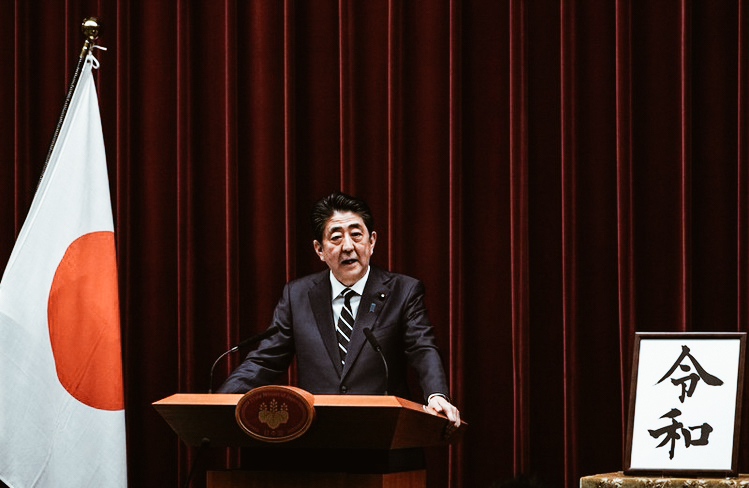 Furthermore, after hearing Prime Minister Abe's speech, my heart was filled with hope. I like the proposal for greater openness to work for those coming from abroad and I believe that this can bring a prosperous future for Japan worldwide. The spirit of cohesion, solidarity and peace may seem an utopia, but it must start from the small things, from us and then spread like the waves produced by a pebble falling into the water. 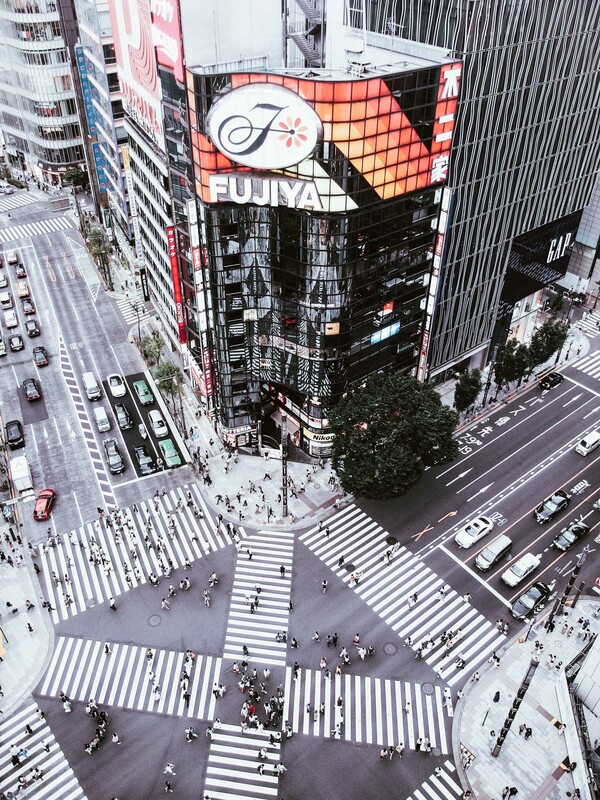 Located in Chuō, Ginza (銀座) is Tokyo's most famous shopping area. This luxurious district was once part of the ancient Kyobashi district, which, together with Nihonbashi and Kanda, formed the core of Shitamachi, the original center of Edo-Tokyo. 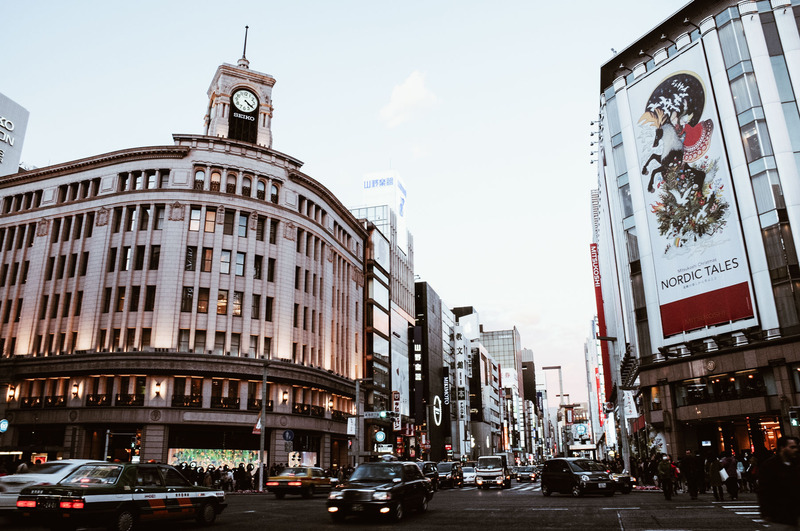 Built on an ancient reclaimed swamp during the 16th century, Ginza owes its name (Silver Mint) to the establishment of a silver coin mint (Silver Coin Mint) on this land in 1612. A devastating fire destroyed much of the area in 1872. Following this incident, the government decided that reconstruction was to use fireproof bricks to erect new buildings, and the roads should be improved and enlarged. 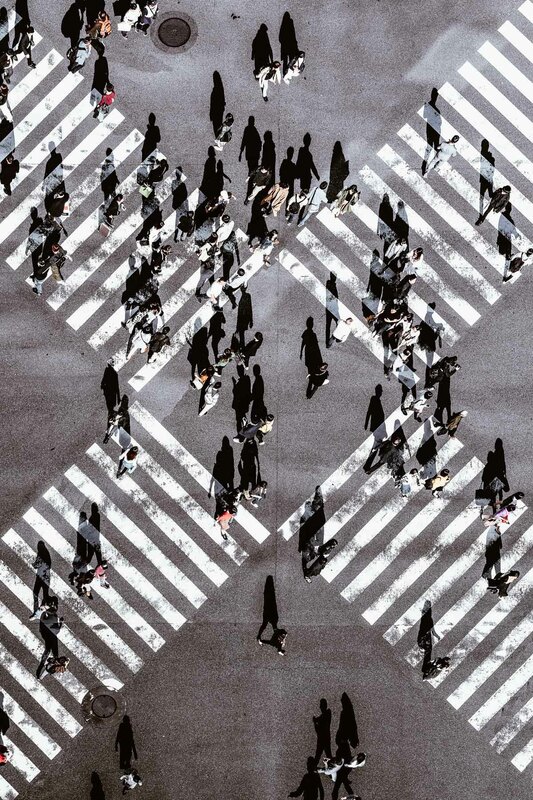 At the same time, they should be able to connect Shimbashi station to Tsukiji. 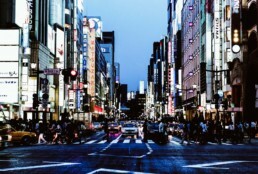 This new version of Ginza was designated as a "model of modernization" and the Irish architect Thomas Waters was given the responsibility of designing the area. In the following year, a long western-style shopping street rose with two- and three-storey Georgian brick buildings reaching from the Shinbashi bridge to the Kyōbashi bridge. 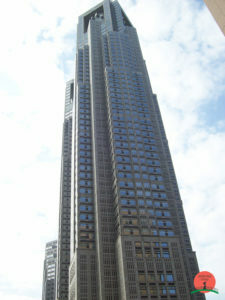 However, the high cost for both the purchase and the lease of these new buildings prevented their long-term occupations and at the same time, an issue regarding the climate arose; such buildings were not suitable for the weather conditions unique to Tokyo. To add to the issues, the design of this area contrasted with the traditional Japanese style, and as such it was not quite appreciated by visitors who were much more interested in an Edo-style town and rather than something "similar to Broadway", as described in the words of the English tour guide writer, Philip Terry. 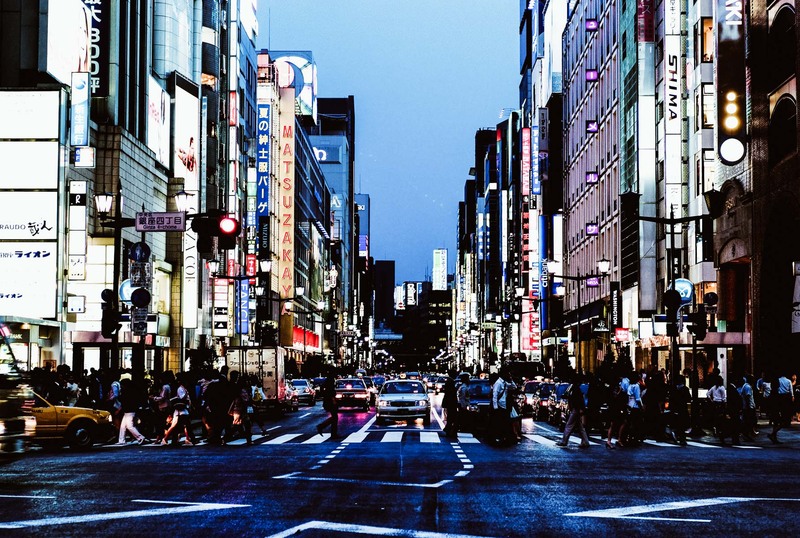 Despite stylistic problems, Ginza managed to flourish as a symbol of "civilization and enlightenment", becoming famous for its rich shop windows. 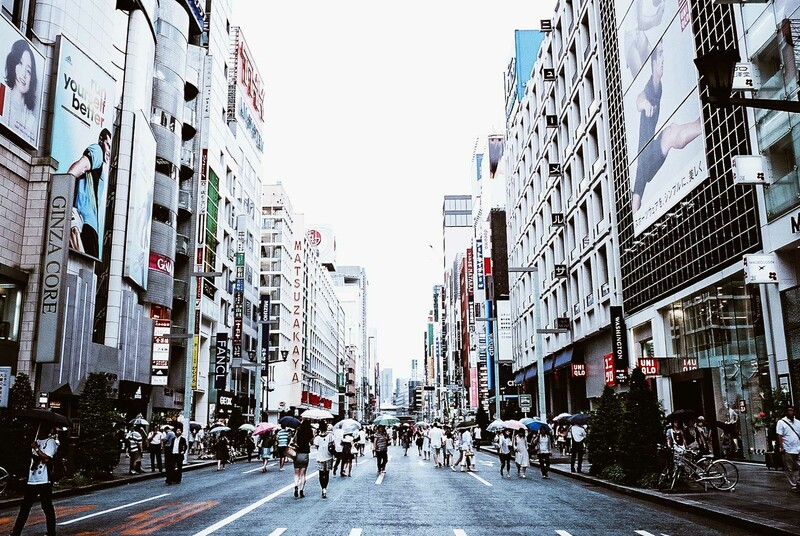 In the period between the two world wars, the habit of spending time and walking through Ginza, even with no purpose, grew very popular. As time passed, most of the European-style buildings have disappeared. Among those remaining is the Wakō building, originally built by Kintarō Hattori, with its iconic Hattori Clock Tower and its luxurious gold objects inside. 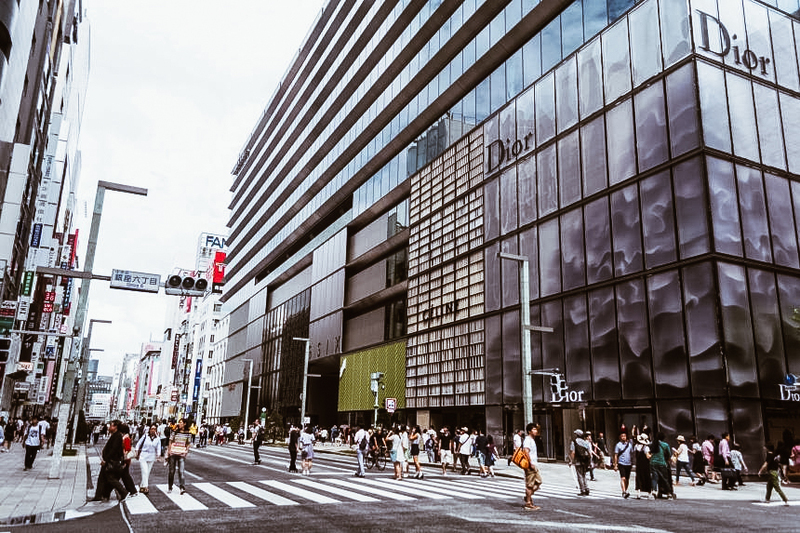 A key stop for shoppers in Ginza is definitely Ginza Six. Opened in the spring of 2017, it is the largest shopping complex in the district. 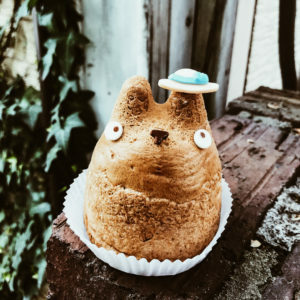 In addition to numerous cosmetic and fashion floors, there are floors dedicated to food and interior design, a large Tsutaya bookstore specializing in art publications, a pleasant rooftop garden and a Noh theater in the basement. No less famous is the store of the chain Mitsukoshi. While this store opened in 1930, its history dates back to 1673, when it was first established. It offers products and services on twelve floors. 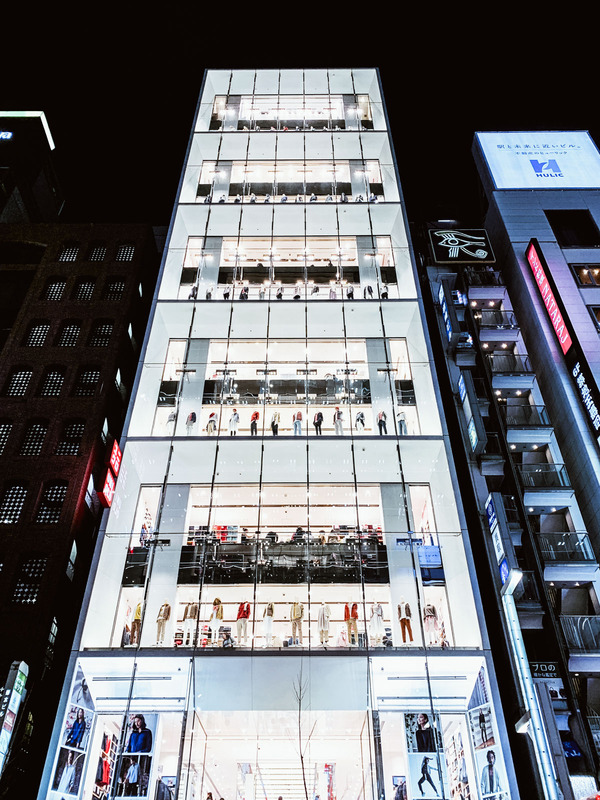 Fans of the brand Uniqlo will find satisfaction in this 12-storey building which offers the widest range of products in the world of this brand. 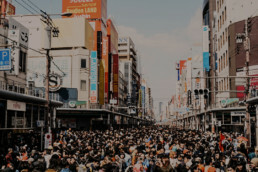 Ginza, however, is not just limited shopping. For Kabuki representations, the best place is found in this part of town. It is the Kabukiza Theater. Do not miss a trip to the Yurakucho Gado-shita Dining as well. 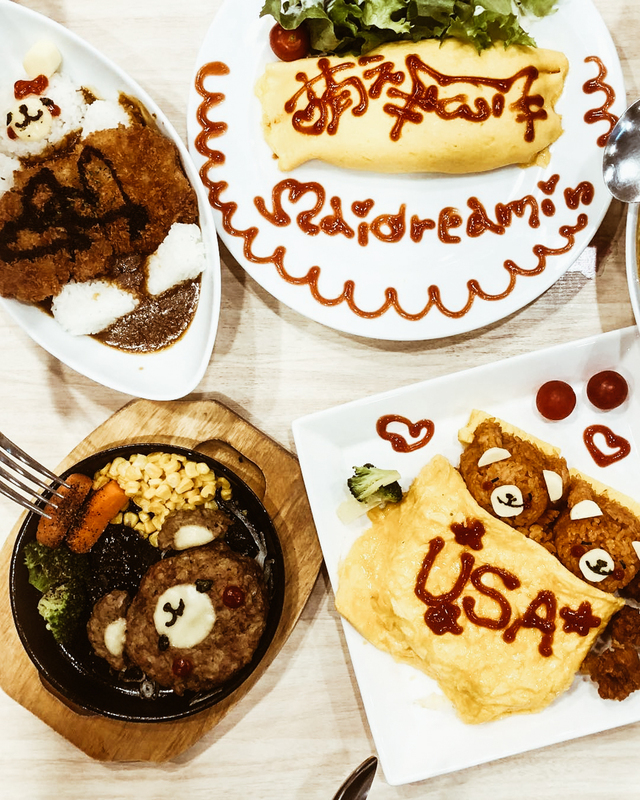 It is one of Tokyo's most interesting dining options, located under the sky train tracks, north and south of the Yurakucho station (In Japanese: Gado-shita, "under beam"). Dozens of restaurants are integrated into the brick arches below the Yamanote line which extend for over 700m. 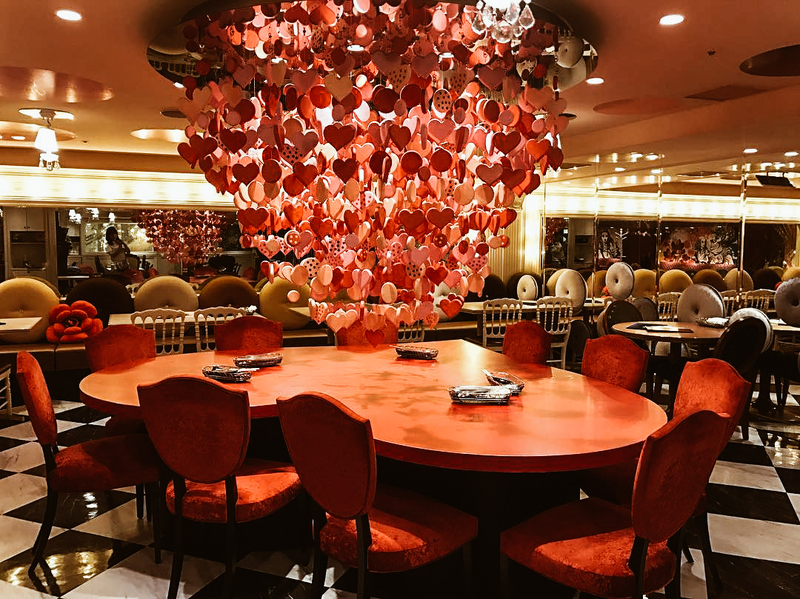 Here you can taste world-famous Japanese cuisine, or sip special wines in the luxurious French wine shops. 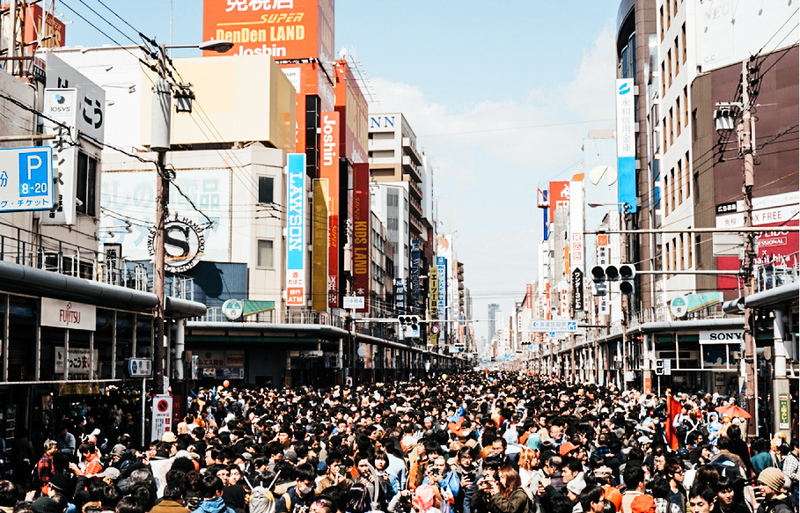 Every year since 2005, between early days and mid-March, the streets of Den Den Town located between Ebisucho Station and Nihonbashi are closed to car traffic for the biggest cosplay event in all of Japan: the Nippombashi Street Festa (日本橋ストリートフェスタ). Den Den Town is the electronic district of Osaka that, thanks to its toy stores, video games stores and computer stores, has begun to attract a large number of manga and anime fans, soon turning into one of the "sacred" destinations for Otaku. Each year the festival is enhanced by attracting not only the local but also a more international audience! Preparations for the event start around 11:00 am with the roads closing to traffic. Here, above the street the main stage on which guests, cosplayers and sponsors alternate throughout the day is built. 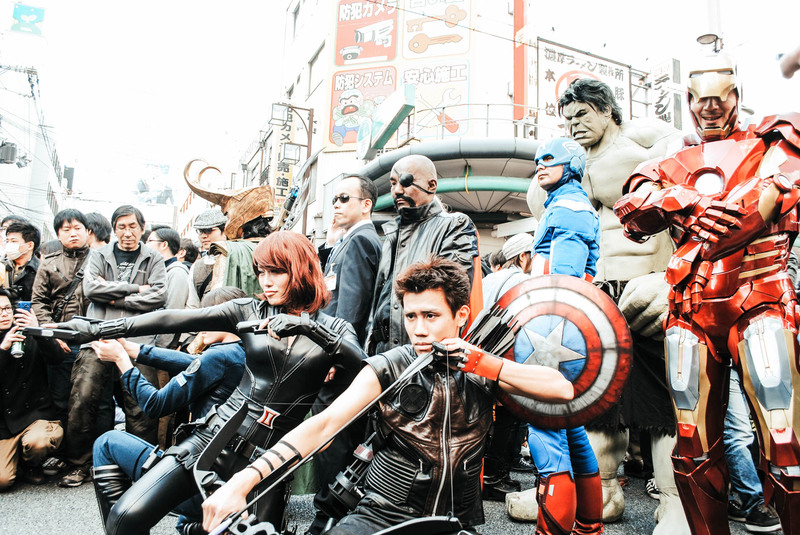 The opening ceremony begins at 12.00 pm when a road is created for the parade of the 1,000 best cosplayers from around the world. After the show, cosplayers perform and pose for all those wishing to approach their favorite character. Many of them take advantage of the event to promote their socials accounts, writing their address on whiteboards or signs placed next to them while they are immortalized in the poses studied in advance. Obviously the event is not open only to professionals, but hundreds and hundreds of people wear their own costume. It doesn’t matter if this belongs to pop culture, anime, manga, video games or even cartoons and characters from American comics (especially Marvel, Adventure Time and Star Wars), almost 10,000 people a year turn into their own hero! Of course, the festival is free, but if you want to participate in the parade, an entry fee of around 1,500 yen is needed. 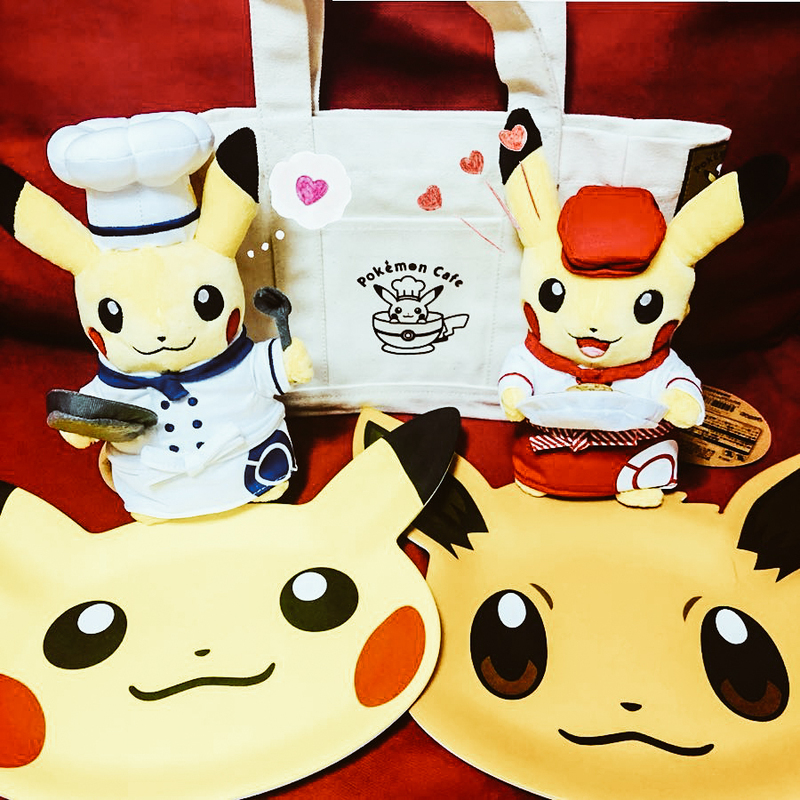 The event is also the perfect opportunity to find unique designs by Nippombashi Street Festa and exclusive goods. 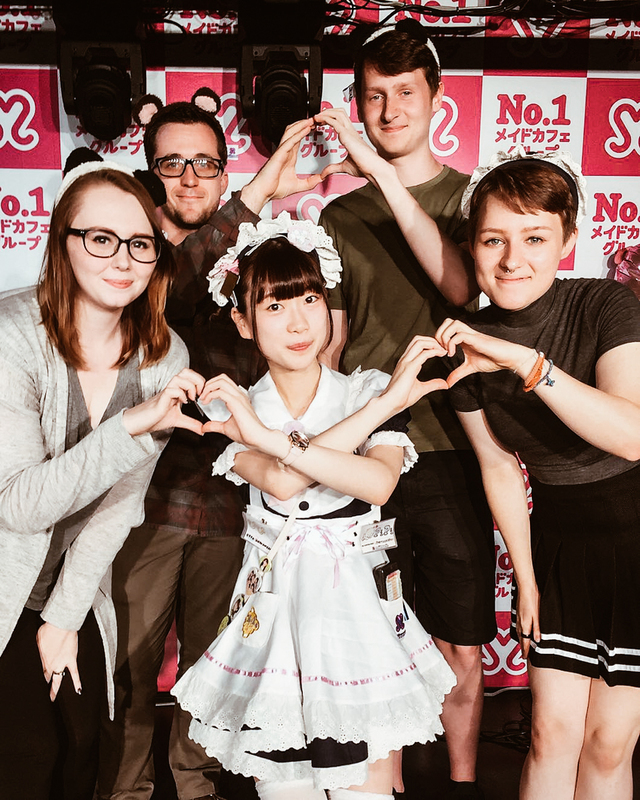 From 2018, year of the 160th anniversary of friendship between France and Japan, the 「Japan-France pop culture Exchange project」was promoted in order to deepen the cultural exchange between manga, animation, music and other aspects of Japanese pop culture with the France in collaboration with the「Japan Expo」. 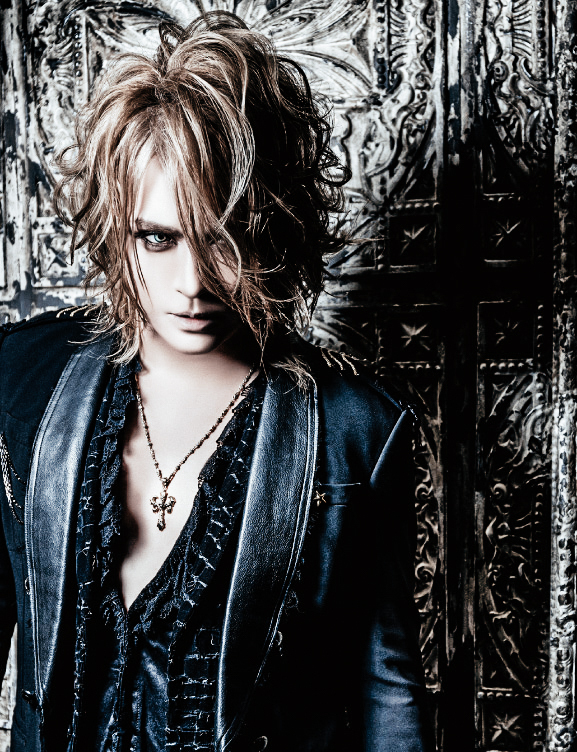 To disseminate the event and make it even more alive, KAMIJO, the talented Japanese artist who became particularly famous in France, was chosen as the project's ambassador. 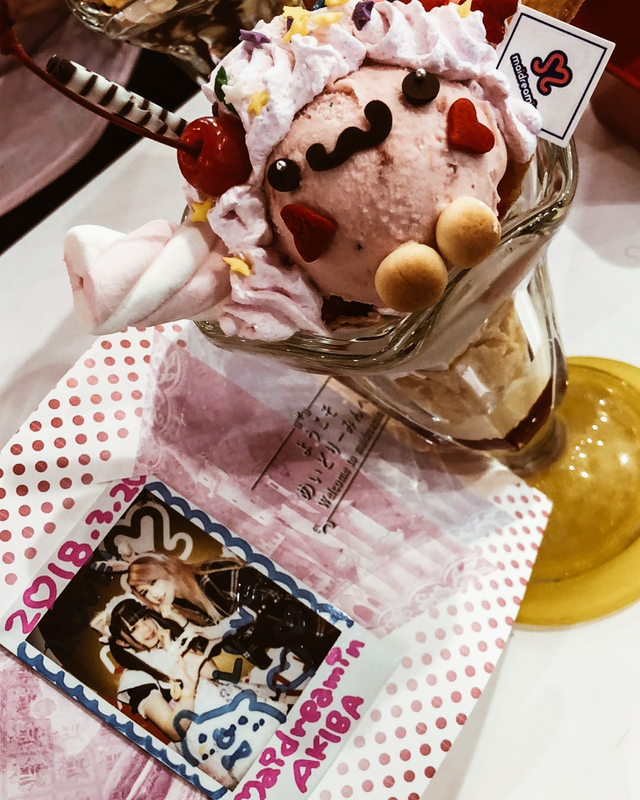 This year the Nippombashi Street Festival will be held on March 9th and will be the perfect opportunity to immerse yourself not only in the magical world of fantasy, but also in the musical world! 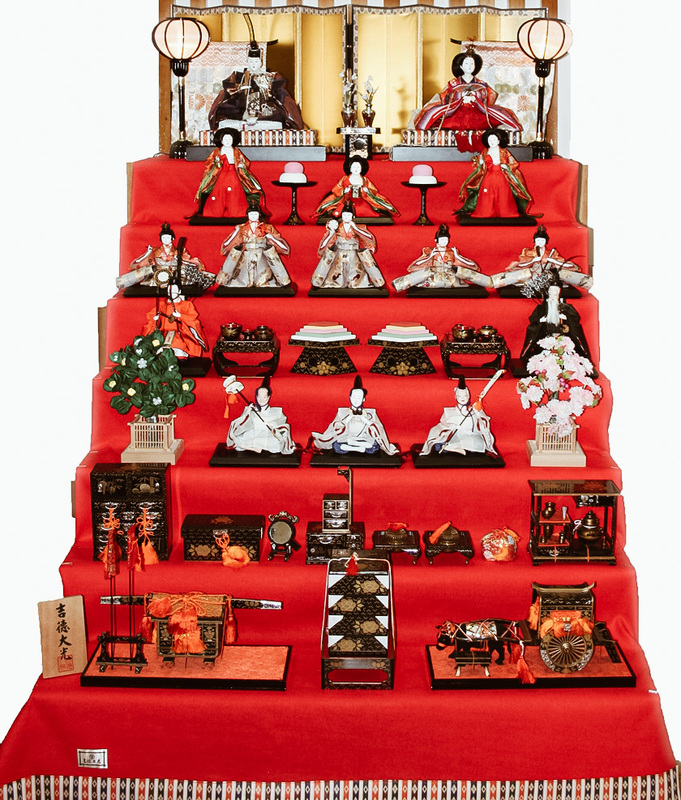 There is a special celebration held annually on the third day of the third month in Japan known as Hina-matsuri (雛 祭 り), also known as Doll’s Day or Girl’s Day. During this celebration, the misfortunes of girls are transferred to the dolls and the family members pray to the gods for their daughters’ good health and beauty. 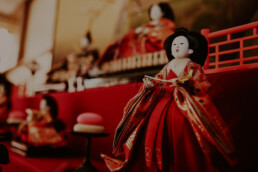 This festival dates back to the Heian period (1650) and in Japanese culture, dolls have always been believed to have the capacity to contain evil spirits. During the Hina-Nagashi (雛 流 し, The floating doll) ceremonies, straw dolls will be placed along the course of a river to take the evil spirits away with them. This ritual is still carried out in some parts of Japan. 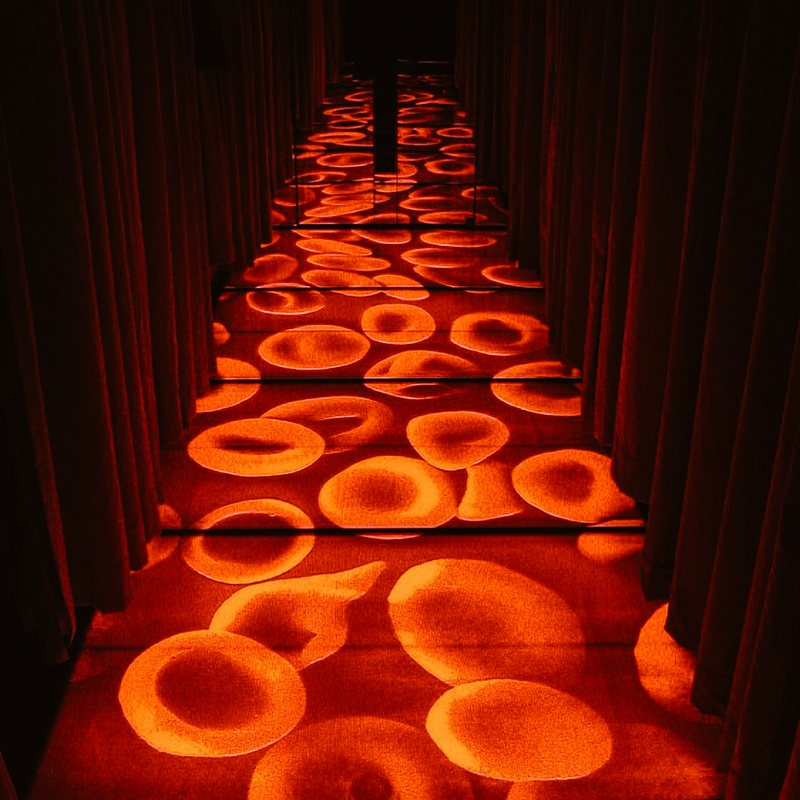 The hina-dan is a platform of 7 steps covered by a red carpet with a rainbow stripe at the bottom, called hi-mōsen. The hina ningyo, ornamental dolls passed from generation to generation, are placed on this hina-dan. On the first step, the highest step, are the dolls representing the imperial court of the Heian period, the position of emperor and the empress, behind them a small golden screen and two lanterns of paper or silk on the sides. On the second step there are three court ladies serving sake and separated by two small round tables (takatsuki), on which seasonal sweets are displayed. On the third step there are five male musicians who are arranged from right to left and based on the instrument they hold in this order: a musician seated with a small drum, a standing musician with a large drum, a standing musician with percussion, a sitting player with the flute and, finally, a singer seated with a fan in his hands. On the fourth step there are two ministers: the younger is placed on the right, the elder on the left. Both of them are equipped with bows and arrows while separated by takatsuki. Three samurai, protectors of the emperor and the empress, are placed on the fifth step. They each hold a rake, a shovel, and a broom with respective expressions of weeping, of laughter, and of rage. On the sixth step there are the objects that the court uses inside the building. On the seventh and final step, the lowest tier, are the objects the court uses when they are far from the building. 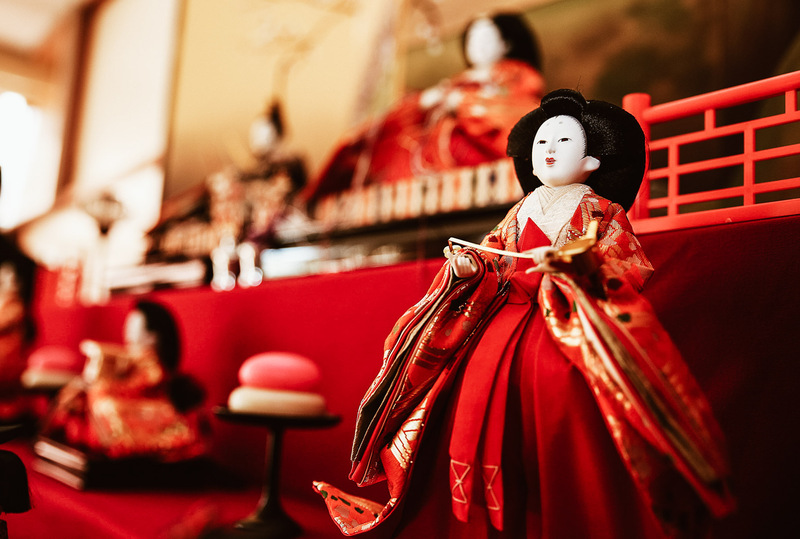 During the festival, girls wear their most beautiful kimonos or dress up like dolls. 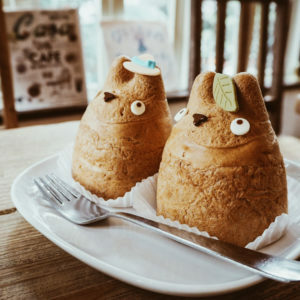 There are numerous themed parties where shirozake, a special sweet and non-alcoholic sake based on amazake (甘 酒, a sweetener obtained from the fermentation of rice), arare (あ ら れ, crackers composed by glutinous rice and flavored with soy sauce) and the traditional sweet of Hina-matsuri, hishi-mochi (菱 餅 ひ し も ち) are served. 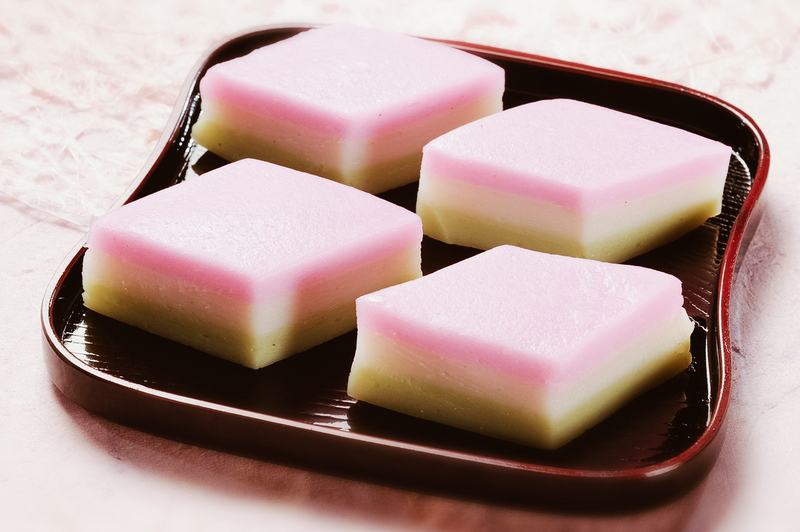 Hishi-mochi is a cube-shaped glutinous rice mixture made up of three colored layers. Each layer holds special meanings. Green represents the grass and symbolizes health; white represents snow, a symbol of purity; and finally, rose represents the plum blossoms fighting malignancy. Together these three colors indicate the arrival of spring, when the snow melts, the grass grows and the plum blossoms start to bloom. 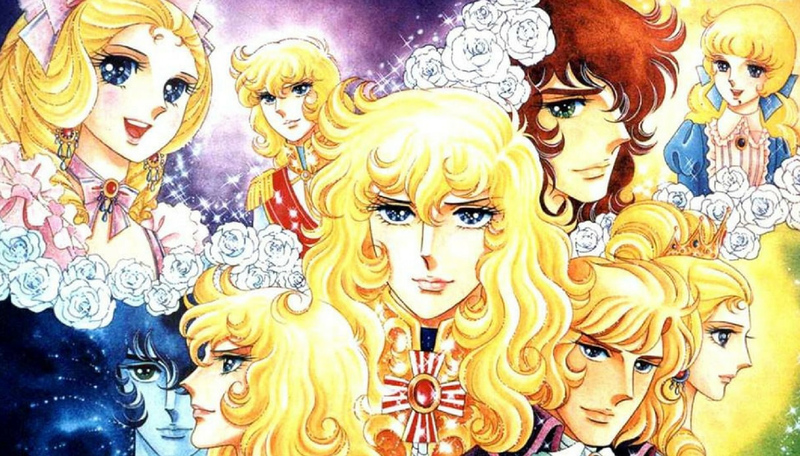 In 1972, Riyoko Ikeda created what became the manga and, later, the most famous anime of all time: "Versailles no Bara" (ベルサイユのばら, The Roses of Versailles, known in Italy as Lady Oscar). 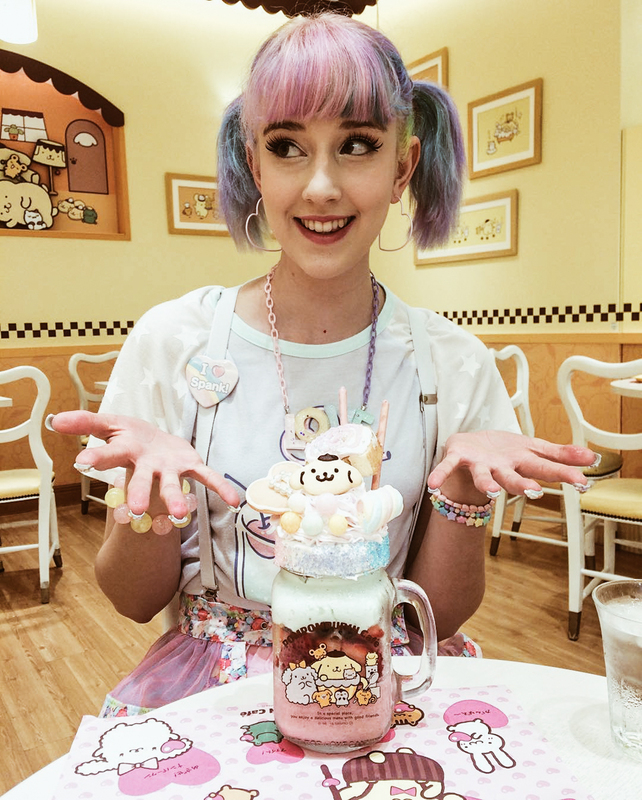 The talented mangaka, whose meticulous and elegant style has come to stand out and be considered the Shōjo Teacher, had to face her own publisher before seeing her published idea. The publisher was in fact convinced that a biographical manga starring Marie Antoinette could bore readers. Riyoko Ikeda undertook to prove otherwise and in May 1972 the first instalment of "Versailles no Bara" appeared on Shukan Margaret issue number 21, published by Shūeisha, on a weekly basis for a total of 82 episodes ended in 1973. 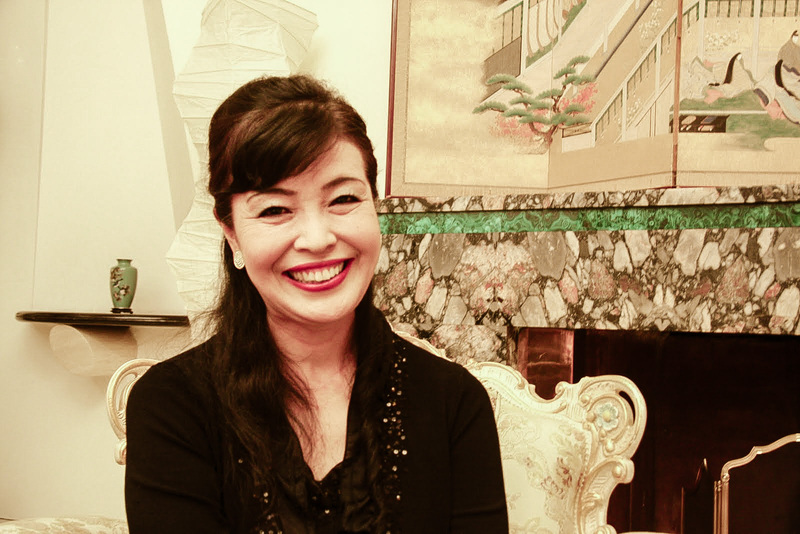 Between 1972 and 1974, 15 million copies were sold, thus electing Riyoko Ikeda as the queen of the historical manga. In the last years of the Ancien Régime, the young Marie Antoinette of Austria was promised to marry the French dolphin, Luigi Augusto, nephew of Louis XV but his cousin, the Duke of Orleans plotted to kill him and usurp the throne. At the head of the Royal Guard was Oscar François de Jarjayes, a young noblewoman raised by her father, General De Jarjayes, as if she were a boy because he wanted a male heir. Alongside Oscar was a young attendant, André Grandier, nephew of the housekeeper of the Jarjayes family, to whom the General had entrusted the task of serving and protecting her. Covering her role, Oscar foiled many plots that aimed to kill the two princes, thus leading to being esteemed and considered a friend by Marie Antoinette. The capricious future queen, escorted by Oscar at a ball court, met the Swedish count Hans Axel von Fersen, of whom both women fall in love. At the death of the King, Marie Antoinette and Louis XVI became sovereigns of France and, since the slander on a presumed relationship between Fersen and the Queen did not take long to spread, the count abandoned the country to avoid scandal and enlisted in support of the revolutionaries of America. Marie Antoinette, more and more unhappy and lonely, allowed herself to be influenced by the Countess of Polignac, an ambitious woman who became her favourite and urged the queen to squander money in frivolity. After a few years, the Count of Fersen returned to France and inevitably went back to Marie Antoinette, who, unable to control her feelings, was on the verge of a scandal. Once again the count left the country and the queen, following the birth of the heirs to the throne, decided to move away from the life of the court and retire with her children in the Petit Trianon, arousing the hatred of the high nobility. In the meantime, the famous "Deal of the Necklace" broke out, which threw the first shadows on the public reputation of the queen. 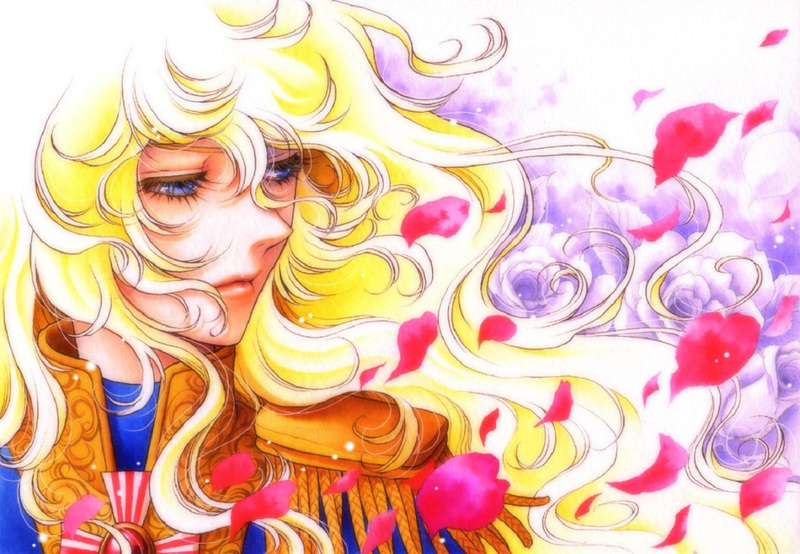 Shortly after, Fersen returned from America and during a court ball, Oscar showed up in disguise dressed for the first and only time as a woman but, dancing with Fersen, realized that she could never replace the queen in the heart of the Swedish count and she decided it was probably better to live forever like a man. Following the case of the Black Knight and the further attempt to discredit the royal family in the eyes of the nobility, Oscar abandoned the command of the Royal Guard obtaining from the queen the post of commander of the French Guards regiment of Paris. André, despite being rejected by Oscar after declaring her love, he remained by her side anyway. General Jarjayes realized that he had made a mistake in allocating his daughter to a military career and began to wish that she would marry, so the second of Oscar in the Royal Guard, Girondel, made her a marriage proposal, but Oscar did not accept, preferring her new soldiers and attempts to earn their respect. The French revolution was at the door: Oscar, who understood to love Andrè, sided with him on the side of the people and together died during the riots of the storming of the Bastille July 14, 1789. The years of the revolution lasted until Marie Antoinette’s execution on the guillotine on October 16, 1793. One series is not enough! 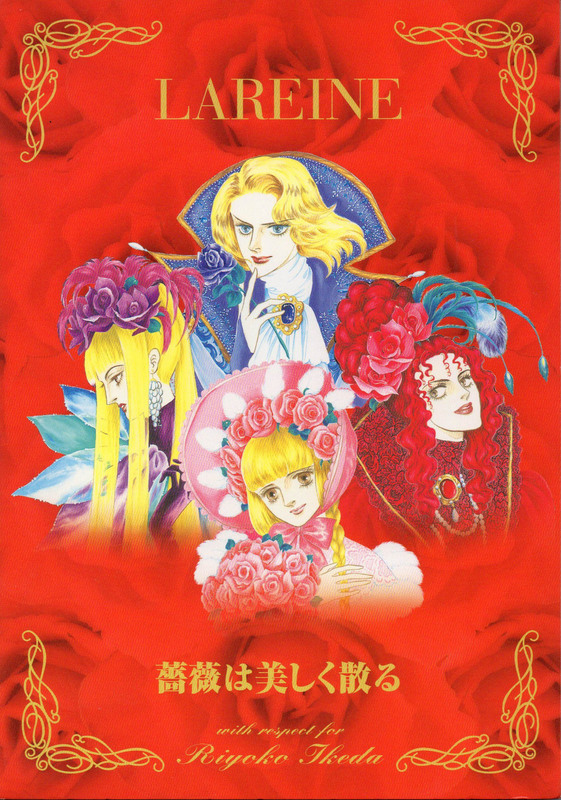 Twelve years after the mother series, Riyoko Ikeda decided to publish a 4-episode miniseries entitled Versailles no bara gaiden (The Roses of Versailles - Gothic Stories) whose protagonists are Oscar, Andrè and the little Loulou de La Lorencie, Oscar's niece. The episodes narrated are placed between volumes 7 and 8 of the original manga. In 1987 Eikō no Napoleon-Eroika (栄光のナポレオン-エロイカ, The glorious Napoleon - Heroic) also appeared as the official sequel, whose title "Eroika" refers to the third symphony of Ludwig van Beethoven, dedicated to Napoleon. These 12 volumes narrate the events of Napoleon immediately after the French Revolution: his empire, the Italian campaign, the campaign of Egypt, the battle of the Nile, the coup d'etat of the 18th Brumaire and the French invasion of Russia. in the course of the narration, some of the already known characters will reappear, but only through flashbacks. In 2006, Riyoko Ikeda decided to take the pencil again to create "Berubara Kids": an amusing reinterpretation in coloured stripes in which the characters of Versailles no Bara reappear in "chibi" version in key scenes. The small parody was published weekly on "Be", a supplement of the newspaper "Asahi Shimbun". 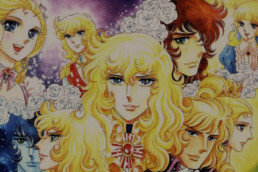 The fascination of Versailles no Bara pushed many musicians to reinterpret the famous "Bara wa utsukushiku chiru" original song of the anime, but Riyoko Ikeda recognized the LAREINE version with license. The first CD came out on October 1, 1998 and in limited number of copies: only 500 with serial number of which the first 4 were owned by the members of the group. Fortunately, in 1998 it was re-edited and Bara wa utsukushiku chiru officially became the fourth single of the band. 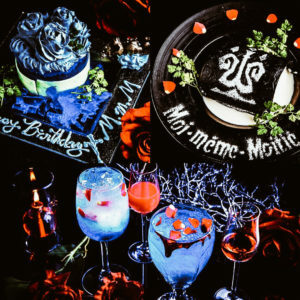 On February 9th 2000 the most valuable CD edition was released, containing only two audio tracks in which Riyoko Ikeda herself participated as a soprano singer and took care of the graphic design, also designing the costumes of the band for the music video. 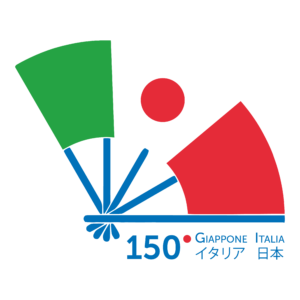 150 years of friendship between Italy and Japan was celebrated in 2016. 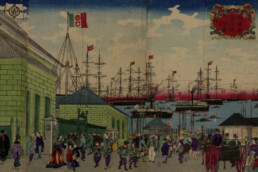 This relationship between these two countries dates back to 1866, on the 4th of July, when an Italian military ship sent by King Vittorio Emanuele II arrived in Yokohama port to offering a treaty of friendship and commerce. Back then, both countries had a common goal. They were eager to close the economic distance that separating them from the other more influential and powerful countries in those days. After the end of First World War, Italy and Japan experienced same outcome. They both won the conflict, however both felt "betrayed" following the Versailles Treaty. 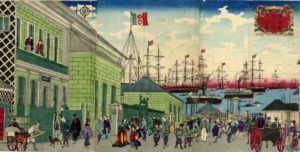 Italy suffered from the indignation of not getting all the territories that it expected while Japan suffered from diplomatic defeats in the rejection of Japan's bid for a racial equality. Moreover, the two countries were experiencing critical post-conflict economic situations that would have led towards a totalitarian regime of the Second World War. In 1937, Italy went against the Russian’s communist politics, like how Japan did when they signed the Anti-Komintern Pact with Hitler's Germany. In the following year, the fascist national party landed in Japan, and Mussolini's works were translated into Japanese. The Germany-Japan-Italy Tripartite Agreement was signed, creating the Rome-Berlin-Tokyo alliance. In that period Mussolini made several visits to Japan. All those who refused to join the fascist party in Japan were interned in the camps at Nagoya. The atomic bombs dropped to Nagasaki and Hiroshima hit Japan hard and both Italy and Japan had to recover from the tragedies caused by the war. At the end of the Second World War, both countries underwent radical transformations. The bridges built between the two countries continued to multiply over the years. In 1970, the first intercontinental television link between NHK and RAI broadcasters led to new cultural exchanges, allowing the products and lifestyles, from food to martial arts and increasingly intense linguistic exchanges, to grow ever closer. In recent times, the mutual influence between the two nations also translated into architectural works. 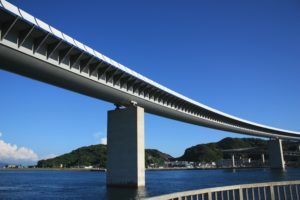 Architect Kenzo Tange, who gave Tokyo its present-day landscape, designed numerous buildings in Italy, like the towers of the Bologna exhibition center and the business center of Naples, while Renzo Piano designed the Osaka airport and Ushibuka Bridge. 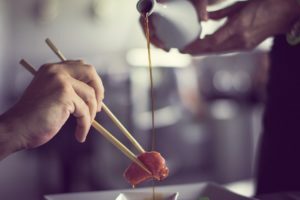 These days, Japan and Italy continue to enjoy cordial and friendly exchanges, growing and strengthening their relationship with each other as they always have through the past 150 years. About Hanami, or the Flower viewing. 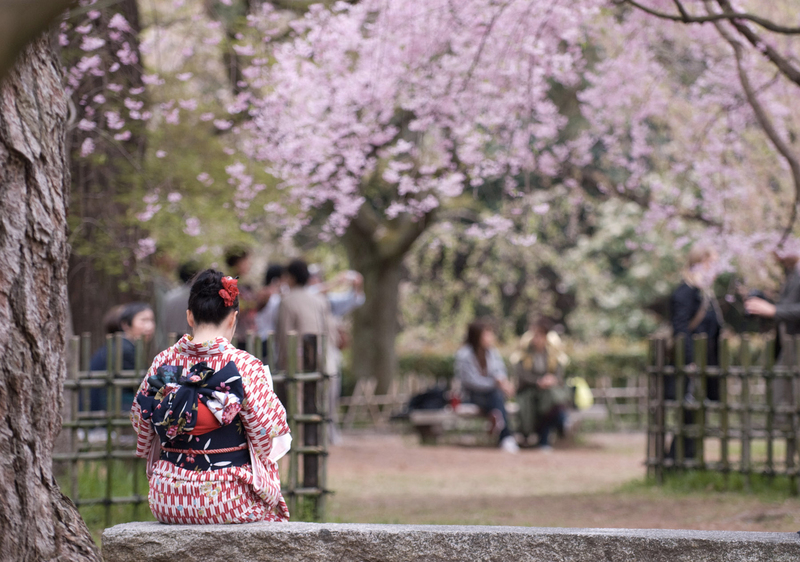 In Japan, spring is synonymous with Hanami. Written with the kanji: Hana 花 "flower" and mi 見 "viewing", the word hanami means enjoying the beauty of blooming flowers. In particular, it refers to the Sakura: cherry blossom. In these words we read the aesthetic symbolism behind the relationship between nature and human beings in which everything becomes harmonious. Spring is, in fact, a "rebirth", therefore a renovation of the soul and of the spirit. The falling flowers indicate the transience of things. As flowers reach the peak when they bloom and then fall to be carried away by water, beauty is therefore wonderful and ephemeral at the same time. In Japanese, we can summarize this concept in the small sentence 物の哀れ, "mono no aware". This aesthetic concept expresses a strong emotional participation toward the beauty of nature and human life, with a consequent nostalgic feeling linked to its incessant change. 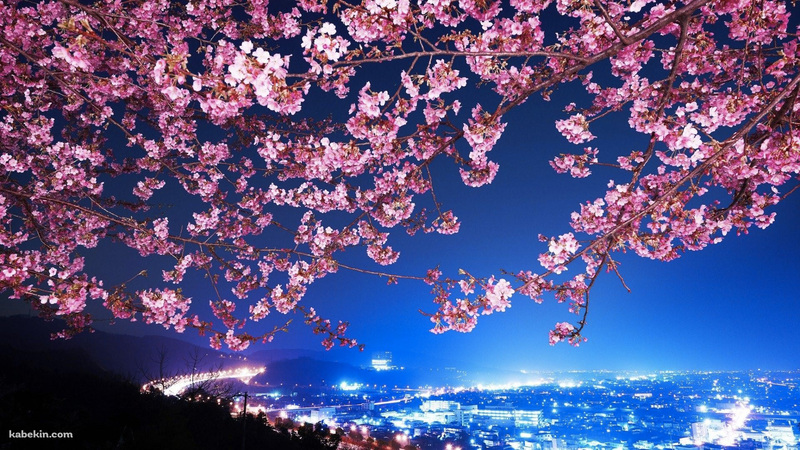 Yoshino hills is where cherry trees originated in Japan. The legend says that in the VII century the priest En-no-Ozuno planted some sakura trees casting a curse on them. The curse would hit anyone who dared to cut the trees down. However, there are those who say that the hanami came from China, at the time of the Tang dynasty, which influenced Japan in the Nara period. Originally, there where the “ume” (prunus trees) to offer viewers the spectacle of their flowering. During the Heian period (794-1185) however, the Japanese imperial court moved to Kyoto where the unparalleled beauty of the cherry trees outshone that of the prunus. 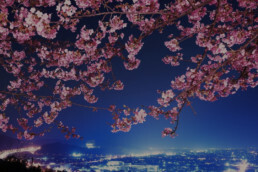 Murasaki Shikibu, the court-lady that wrote the "Genji Monogatari”, the first novel ever written, used the word “hanami” related to the cherry blossom viewing for the first time. In the beginning, it was a rite restricted to an elite of nobles, dignitaries, samurai and poets, that drank sake and recited haiku on the beauty of the cherry blossom. In the following Edo period, the hanami spread to lower classes as well, eventually becoming a national holiday. This was also thanks to the shogun Tokugawa Yoshimune that planted areas of cherry blossom trees all over Japan. The hanami takes place in a period of time that extends from March to April when sakura reaches their blooming season. Traditionally, people gather together laying out their blue tarps under the trees and, armed with their bento, enjoy the spectacle of nature eating traditional dishes. Among them we can find the hanami-dango, rice dumpling of three colors: pink, white and green, accompanied by green tea and lots of sake. 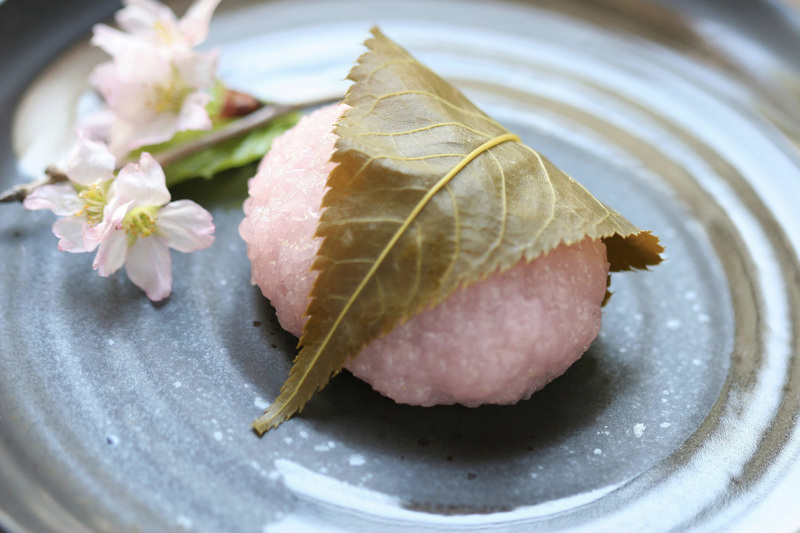 Another typical dish is the sakura mochi, a sweet made of red bean paste and rice, all wrapped in a pickled cherry blossom leaf. And the enjoyment goes on until the evening arrives, culminating in the Yozakura 夜桜 when the night is illuminated by chochin, traditional colored lantern made of paper. Japan is completely invaded by the simultaneous blooming of the trees awaken from the winter torpor, something that strikes the heart as well as the eye. But there are places where the charm of nature is more overwhelming than anywhere else. Among the must-see spots there is the Maruyama park in Kyoto, that is famous for the Shidarezakura, the unique weeping sakura. In Tokyo we can find the Ueno Park with its ancient temples and the Shinobazu pond. The Himeji castle, Hyōgo prefecture, is surrounded by a labyrinth-like wood of cherry trees, while the Hirosaki Castle, Aomori prefecture, is famous for its 2,600 cherry trees. Also, Mt. Yoshino, Nara prefecture, is where 100.000 cherry trees stand out on top of the mountain.